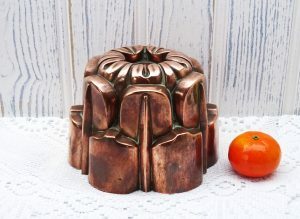 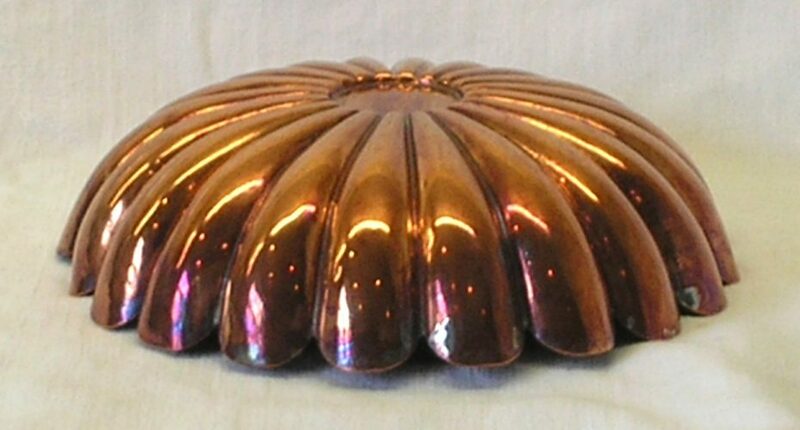 A lovely Victorian copper jelly mould, in the manner of Benham & Froud. 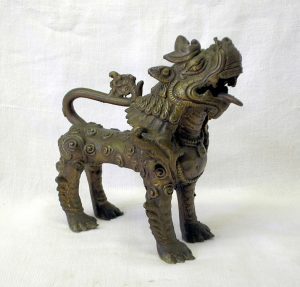 A highly detailed traditional 19th century Nepalese brass Foo Dog (also known as Guardian Lions – their correct name). 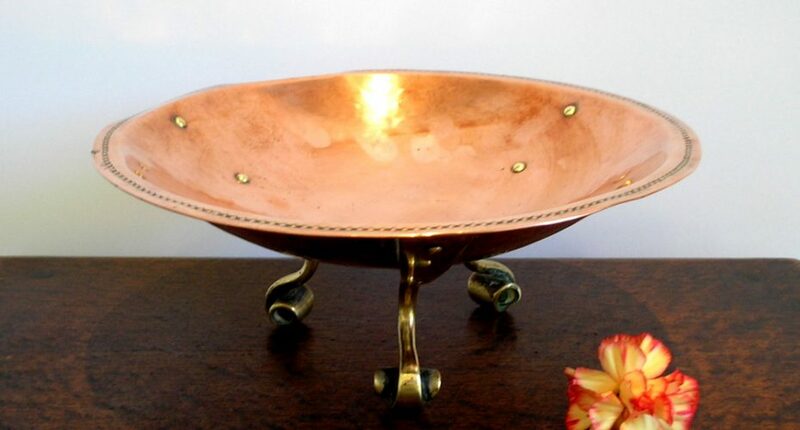 A small round Arts & Crafts style copper dish of simple but pleasing form. 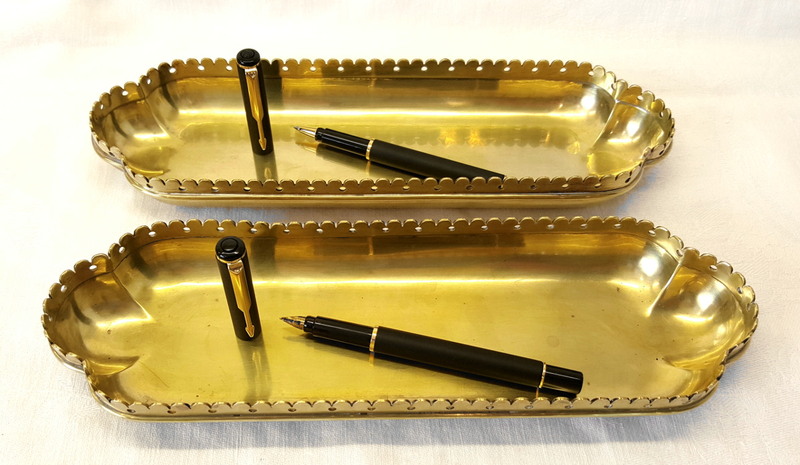 A rare pair of Victorian brass pen trays. 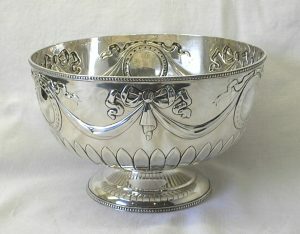 The rims have a scalloped and pierced design giving them a mildly Gothic look. 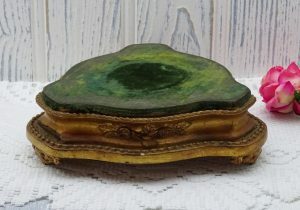 The trays have a stamp on their bases, not dissimilar to the sunburst of Tonks, but additionally featuring a heart shape inside. 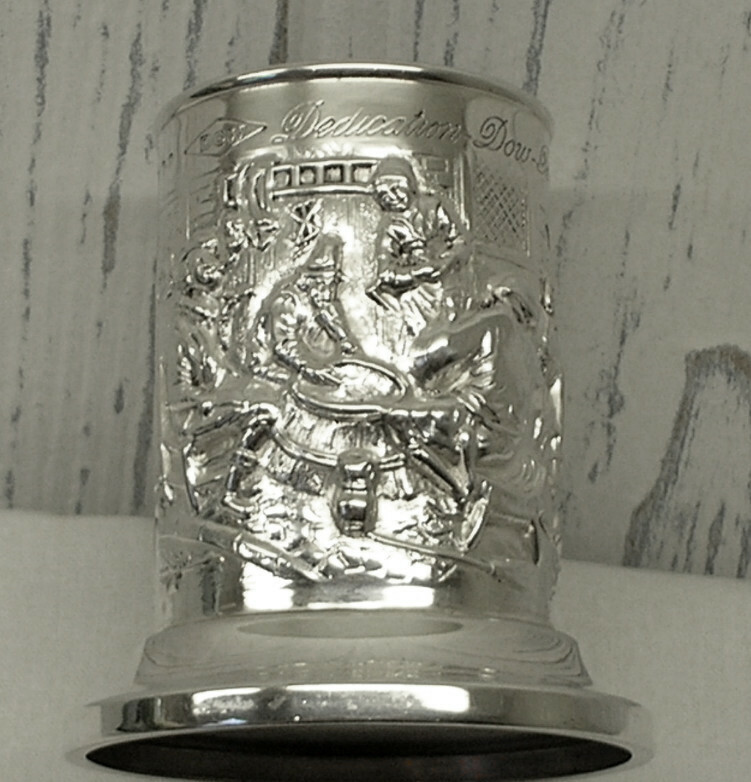 A delightful Victorian Sterling Silver sugar caster by Haseler Brothers (Edward John & Noble), hallmarked for the London Assay Office with the date letter ‘C’ for 1898 with the makers stamp of EJH over NH in a shield. 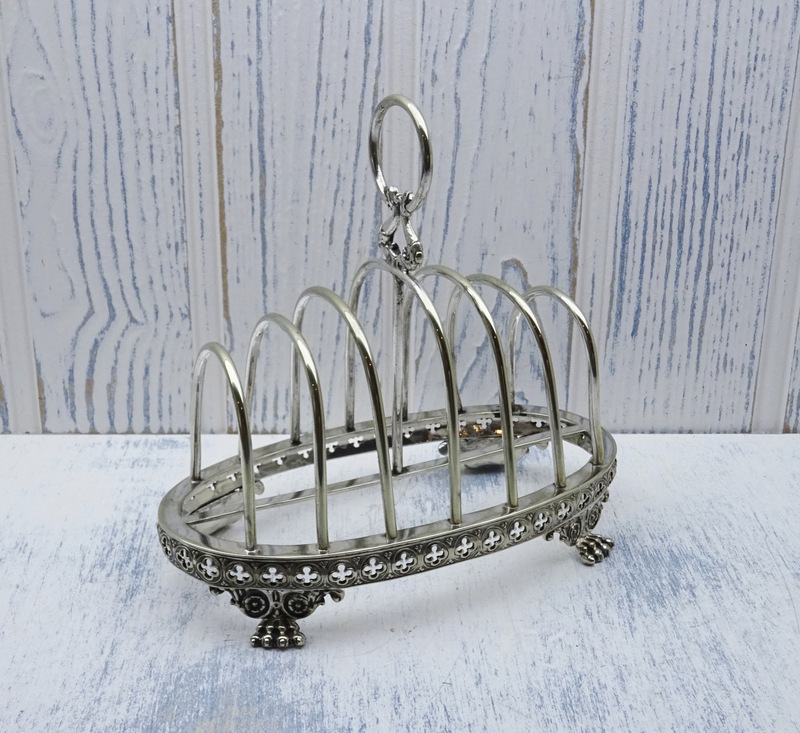 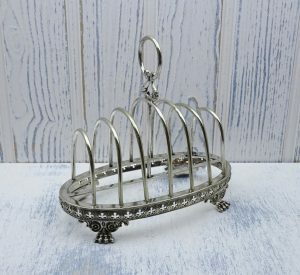 A lovely Gothic style silver plated 6-slice toast rack of elaborate design detail. 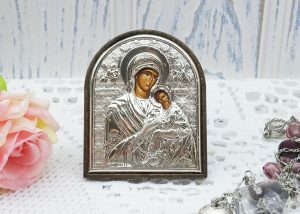 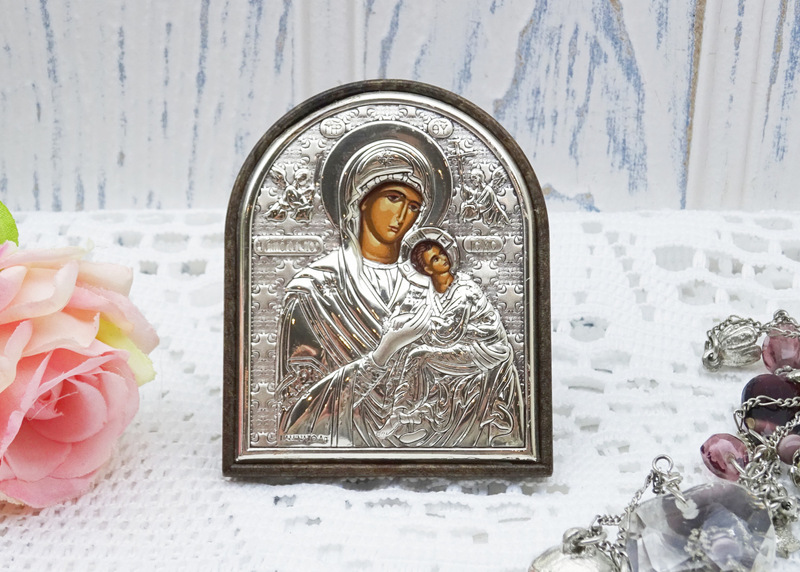 A lovely silver plated Greek Orthodox icon of The Virgin Mary and baby Jesus. 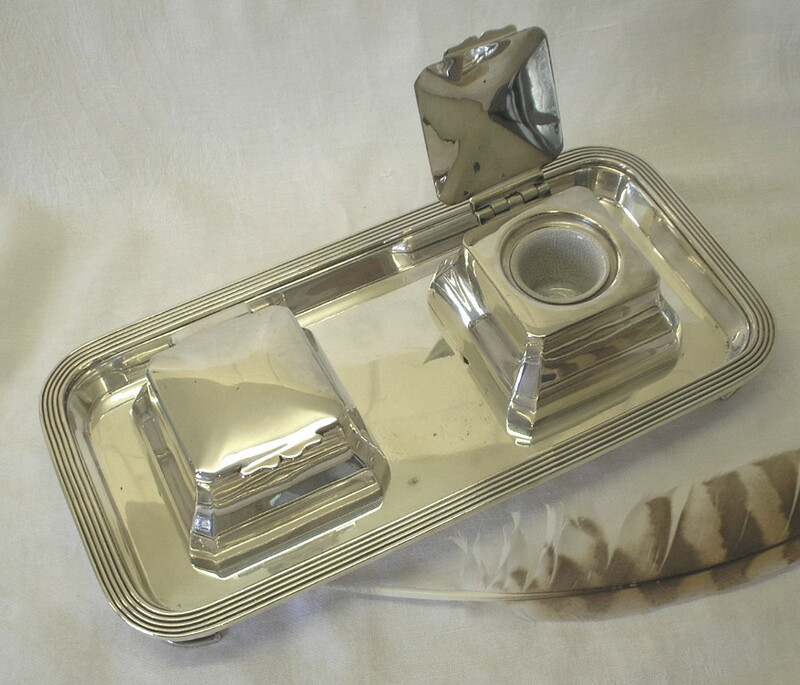 Marked Laminato Ag (silver plated). 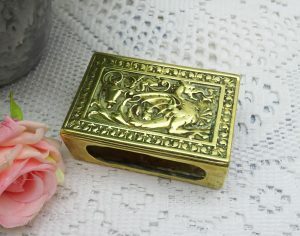 An unusual vintage brass matchbox holder featuring a dragon or wyvern. 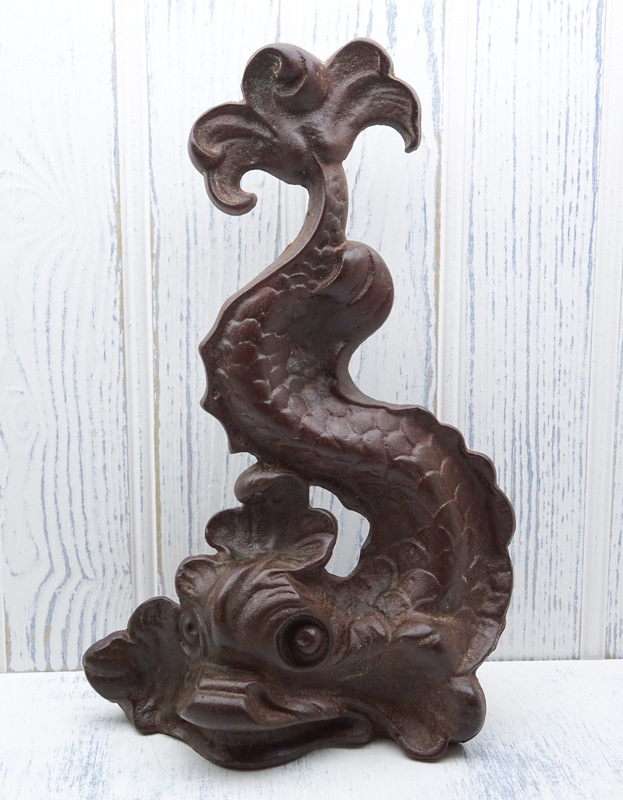 A large cast iron doorstop standing over 1’ tall in the stylised form of a Koi carp, devil fish or sea serpent. 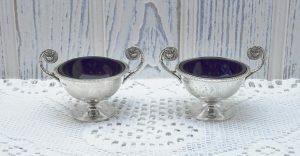 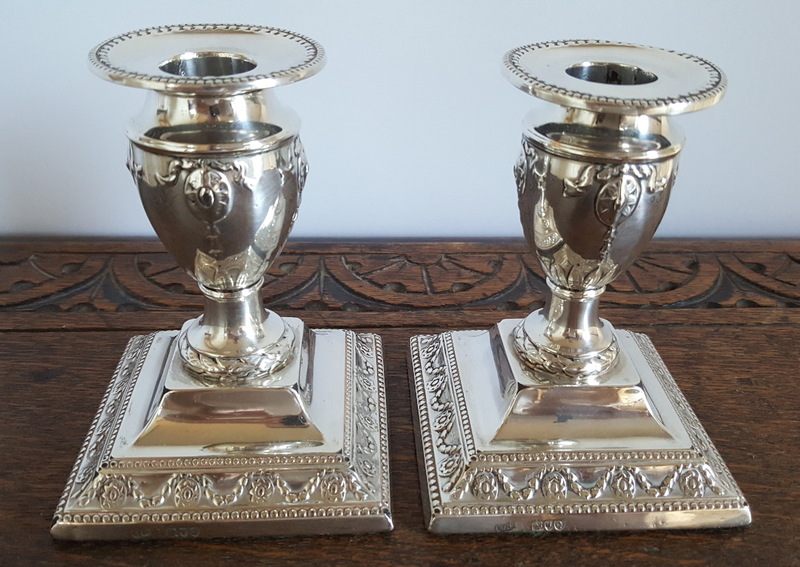 A very elegant pair of George V silver salt cellars, in Regency style, by James Dixon & Sons. 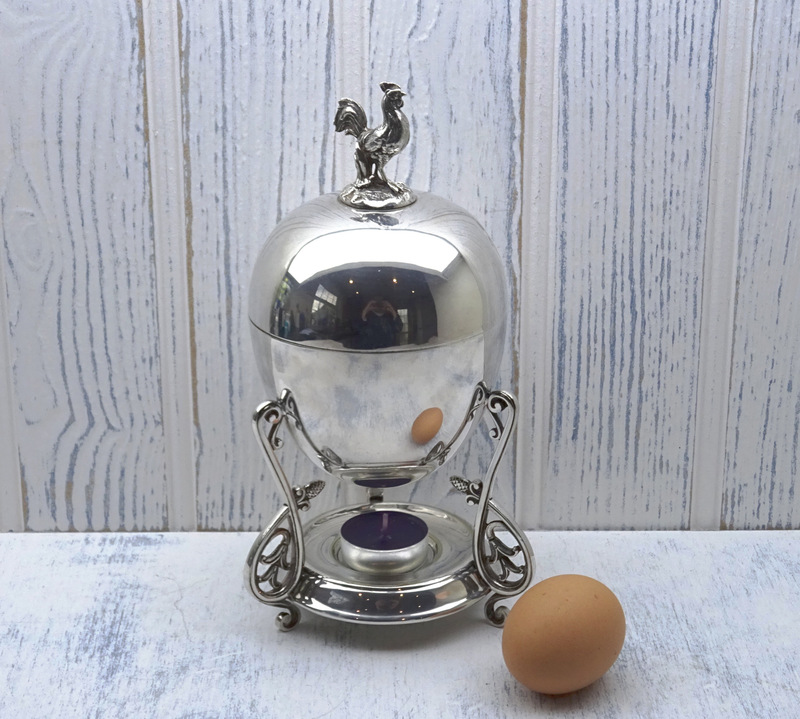 A Victorian silver plated egg coddler by Elkington & Co. 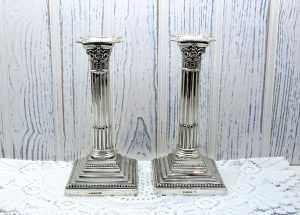 The manufacturers stamp is on the base and bears the date letter M for 1873. 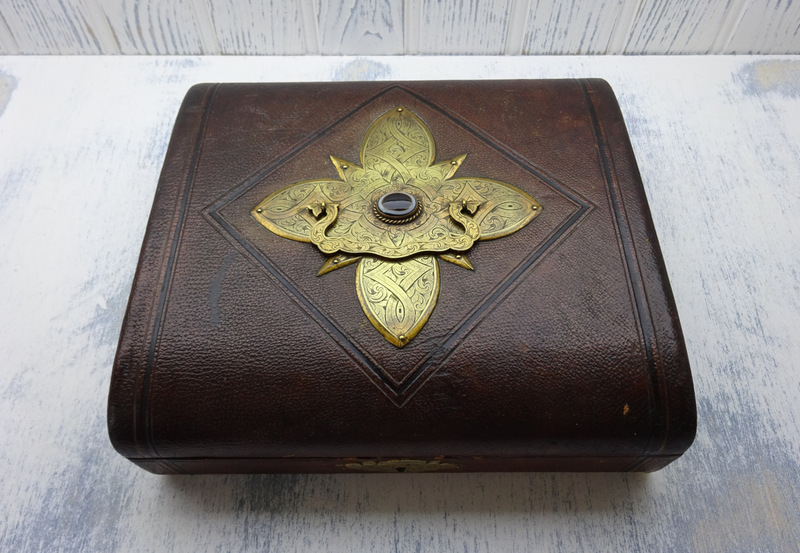 A wonderful and unusual Victorian jewellery box, encased in tooled leather with a delightful brass handle and escutcheon. 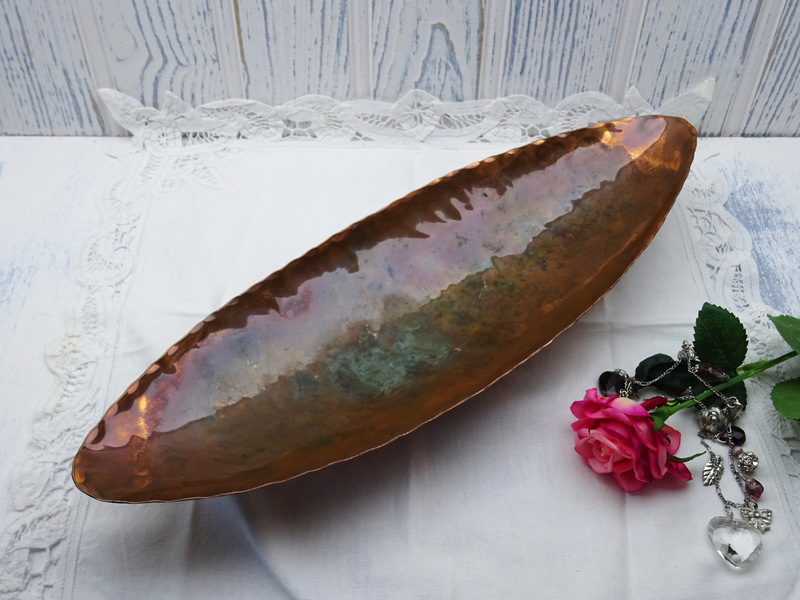 An interesting modernist leaf-shaped copper dish or tray with good patina. 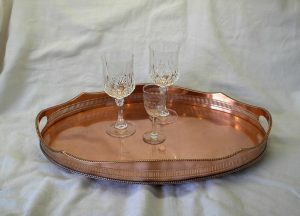 This tray was made by E.C Co and is stamped: hand made in Rhodesia. A pretty late Victorian silver plated four-trumpet epergne or table centrepiece, made by Henry Wilkinson & Co between 1872 – 1892. 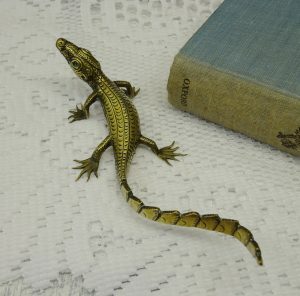 A very sweet brass lizard ornament, with blue glass eyes, delicately and expertly cast and decorated in a very life like fashion. 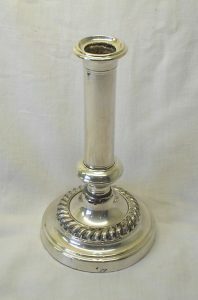 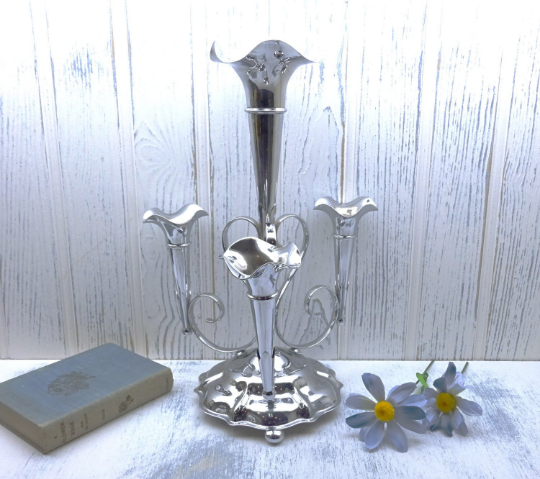 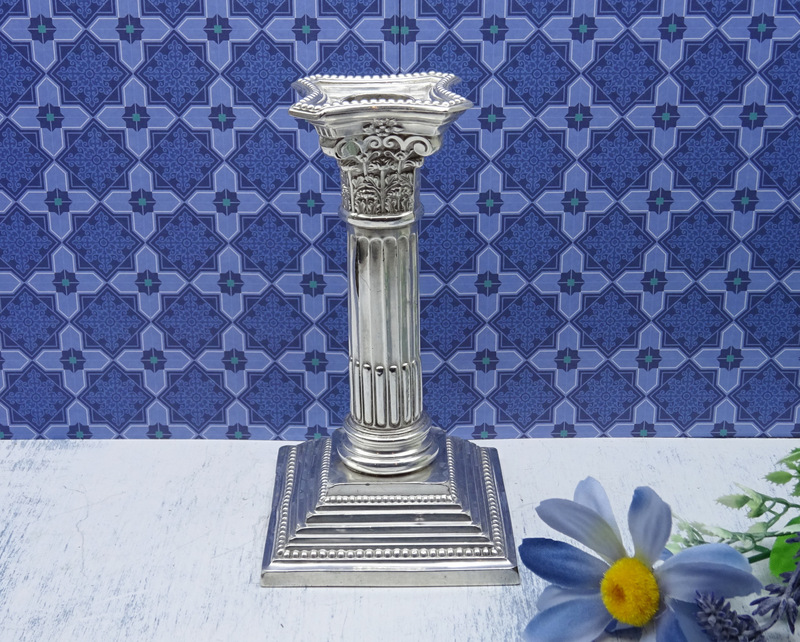 A single Edwardian silver Corinthian candlestick by Williams Ltd, hallmarked for Birmingham 1909. A 19th Century French giltwood stand with green velvet top. 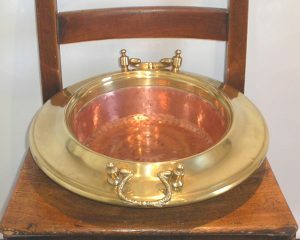 A lovely circular Victorian copper bed or baby’s cot warmer. 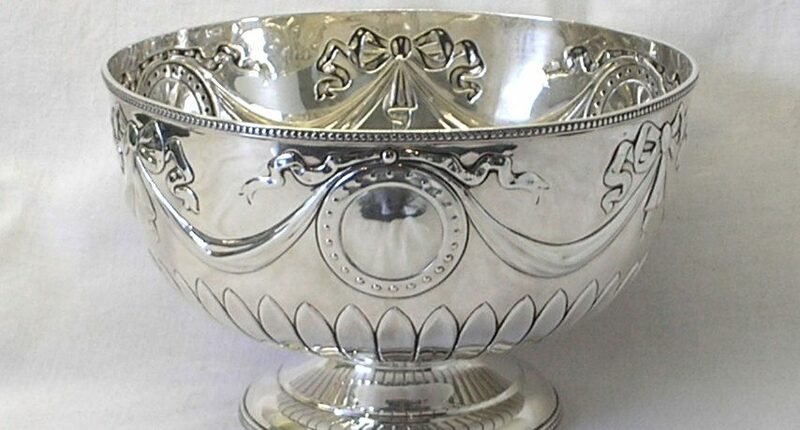 A beautiful Edwardian solid silver footed bowl by William Hutton, hallmarked for the London Assay office and dated 1904. 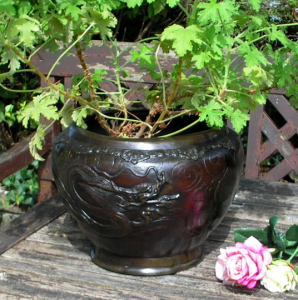 An attractive antique bronze Chinese jardiniere / planter depicting a Chinese pearl dragon. An antique copper jardiniere featuring four semi-circles of flowers and petals. 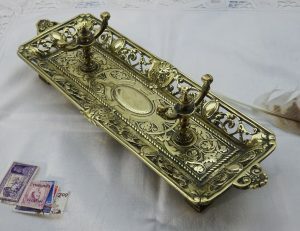 A stunning 19th century Italianate brass pen tray, with a fretworked border, lions heads, acanthus leaves and scrolls. 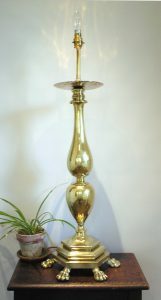 An early 20th century folding brass wall sconce / candle holder. 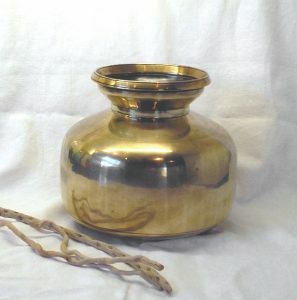 This piece is from Java, the original usage being a spittoon. 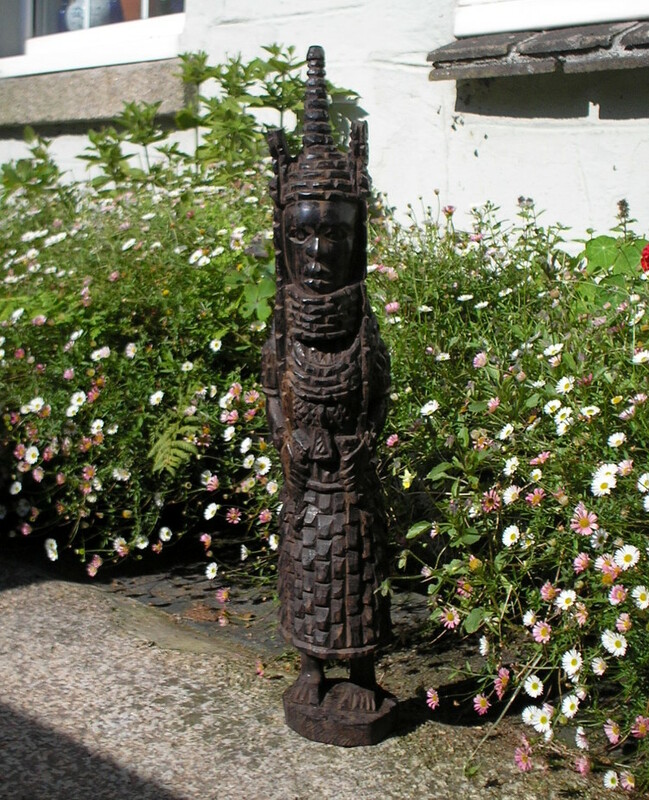 Another virtually identical example can be found in the Asian Civilisations Museum at Empress Place, Singapore. 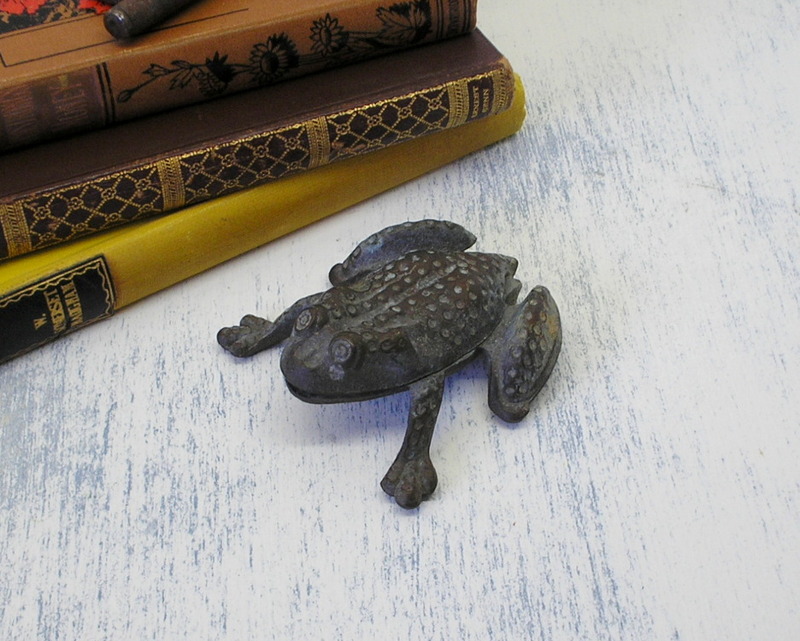 A quirky ashtray in the guise of a frog. 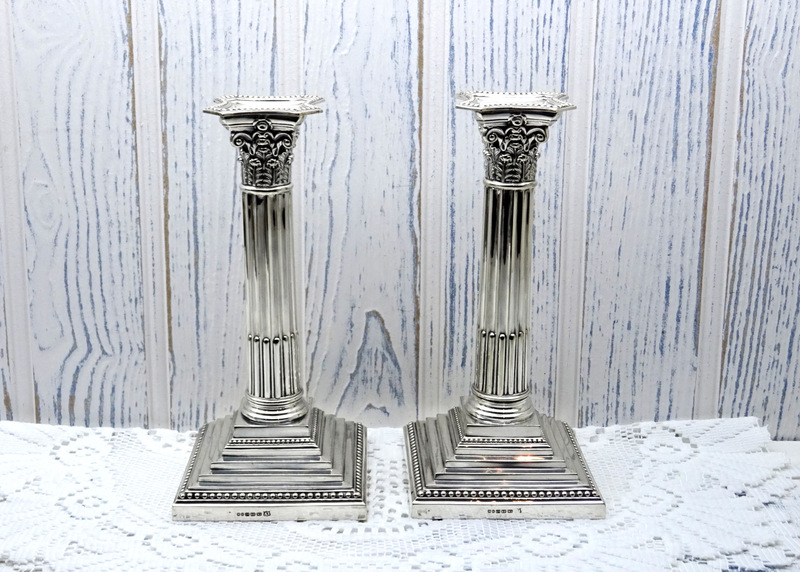 A very good pair of Victorian silver plated Corinthian column candlesticks by R.F Mosley. A delightful vintage bronze reproduction of an antique Oriental lidded jar featuring stylised dragon motifs. 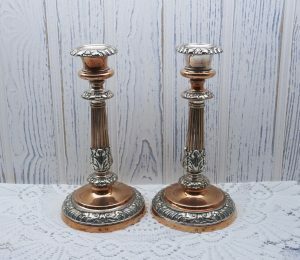 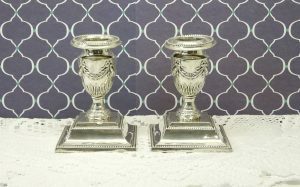 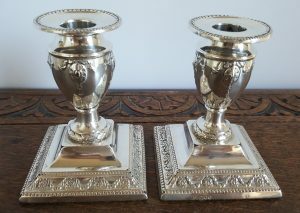 A lovely pair of Georgian Old Sheffield Plate candlesticks by the sought-after silversmith Matthew Boulton. 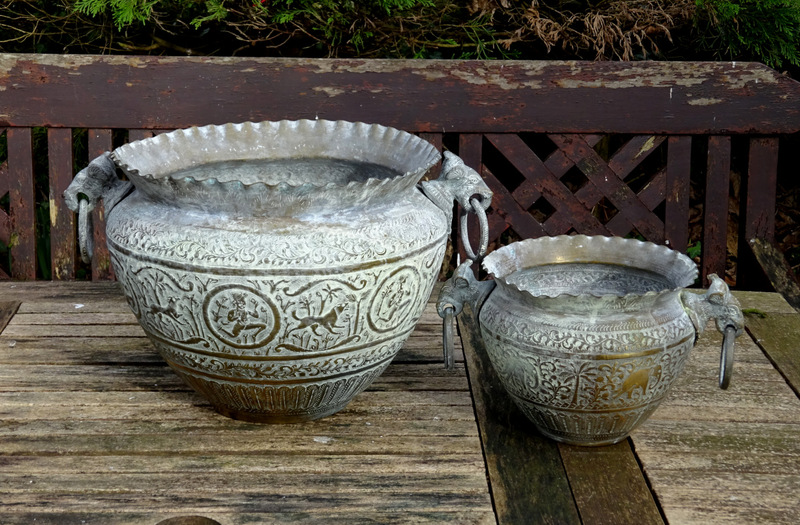 A rare set of four silver plated and gilt goblets and a pair of bud vases designed by Gerald Benney in the ‘Bark’ design. 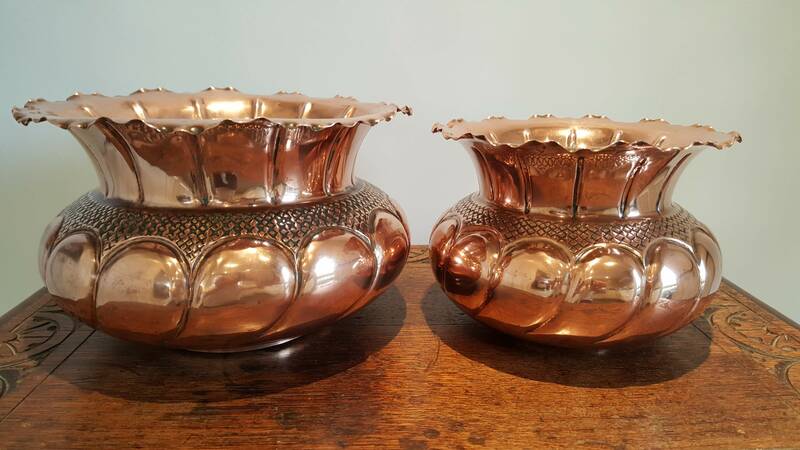 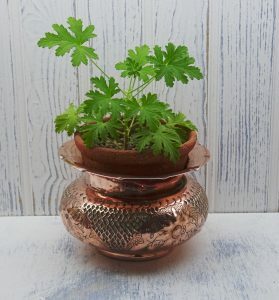 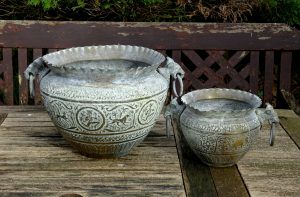 A lovely and rare pair of copper planters by the sought-after manufacturers Benham & Froud. 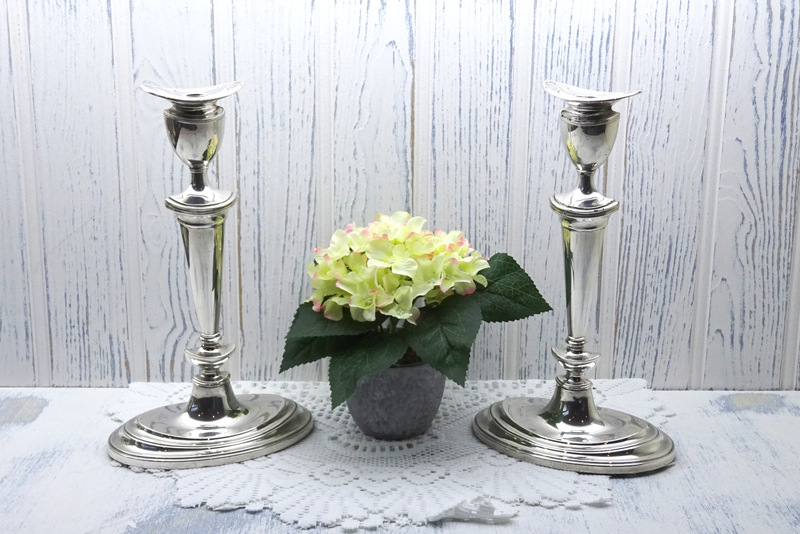 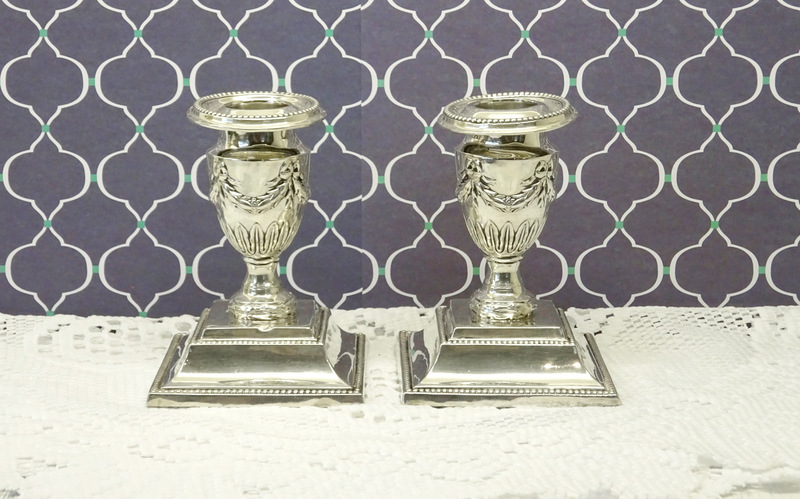 A beautiful pair of 19th Century Adam style silver plated candlesticks. 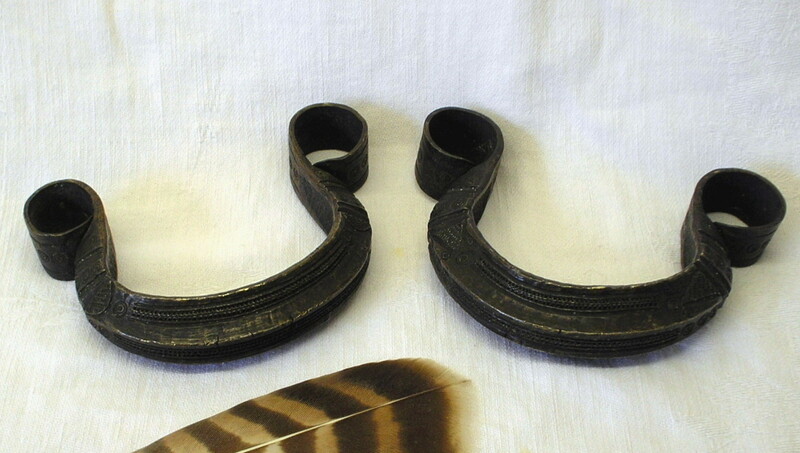 An interesting pair of engraved bronze West African manilla armlets. Manillas, also known as Okpohos, were metal penannula bracelets or armlets used as a traditional African currency. 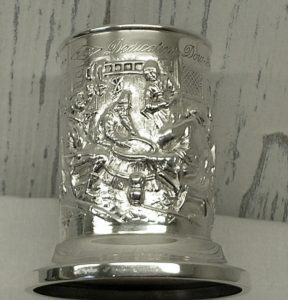 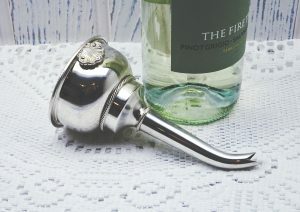 A quality Georgian style two-piece silver plated wine funnel. An unusual French brass planter made in Paris. 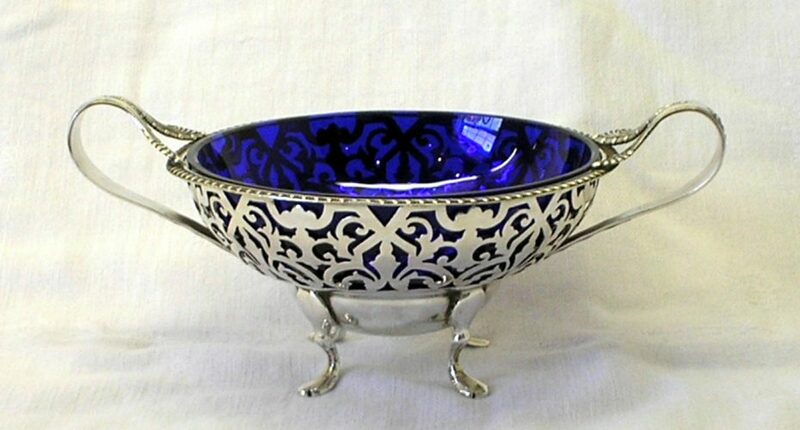 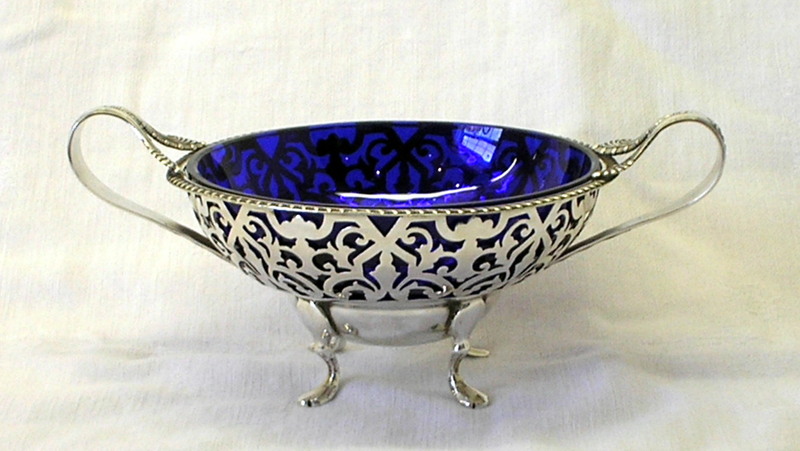 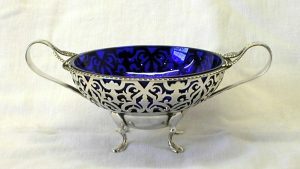 A simply stunning Edwardian fretworked silver bonbon dish with a cobalt blue glass liner. 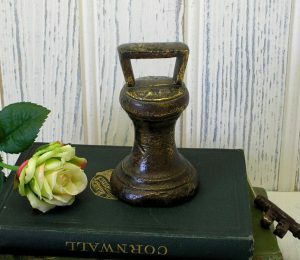 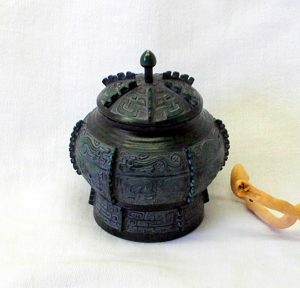 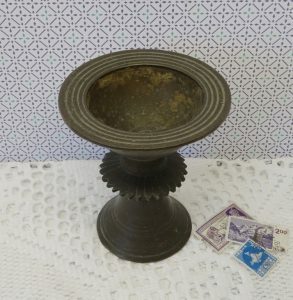 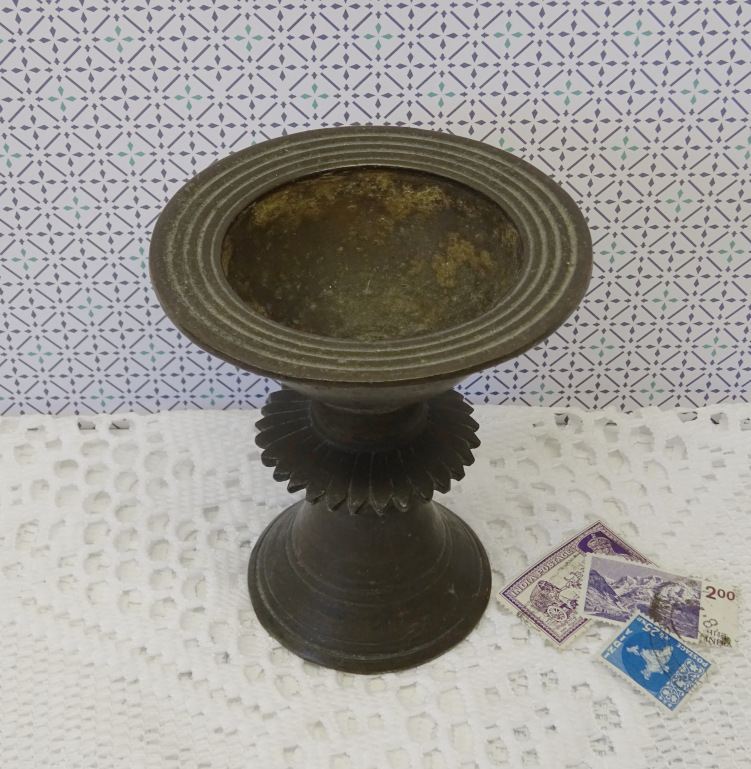 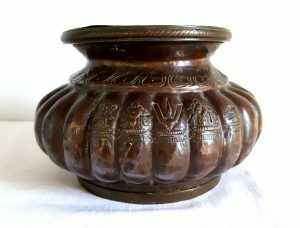 An 18th or 19th Century bronze pedestal butter lamp traditionally used in Tibetan or Nepalese Buddhist temples using clarified yak butter (ghee). 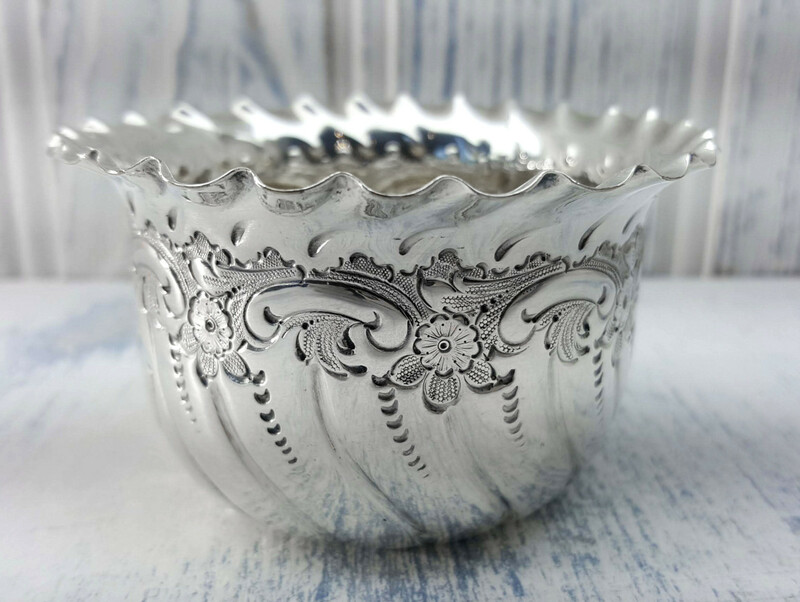 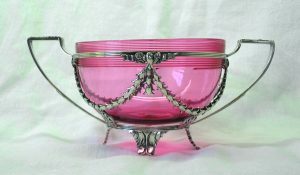 A very pretty Baroque silver plated sugar bowl made by the well know silver smiths James Dixon and Sons, for the retail arm of Z. Barraclough of Leeds. 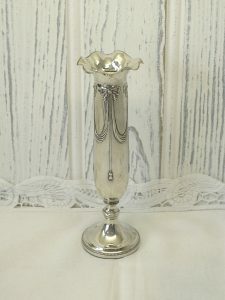 A stunning Art Nouveau silver plated tall bullet shaped bud vase made by WMF (then known as Württembergische Mettallwarenfabrik). 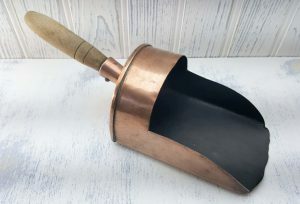 A lovely late Victorian or early 20th Century antique copper coal or grain scoop. 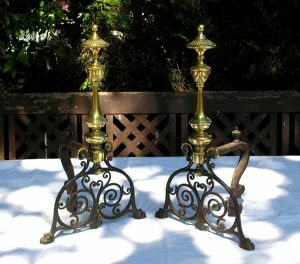 A pair of Victorian brass ecclesiastical Gothic candlesticks. 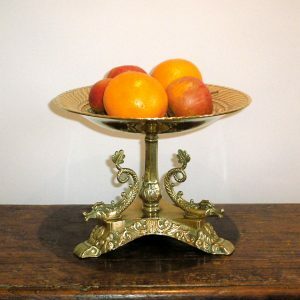 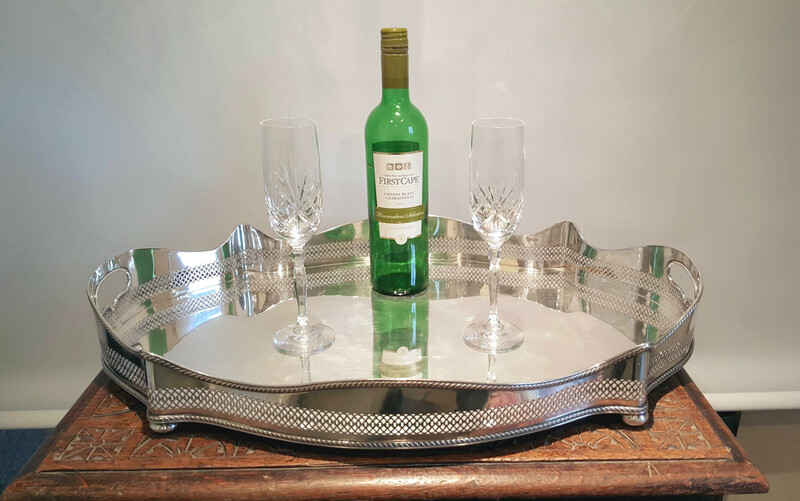 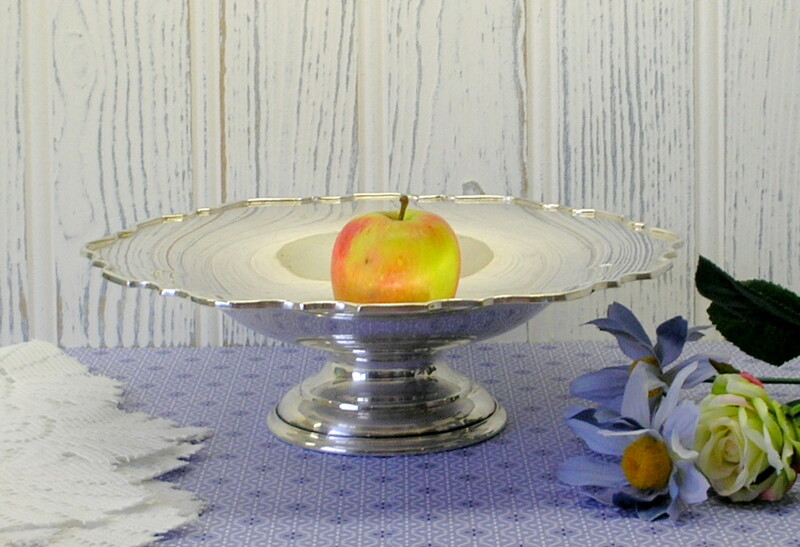 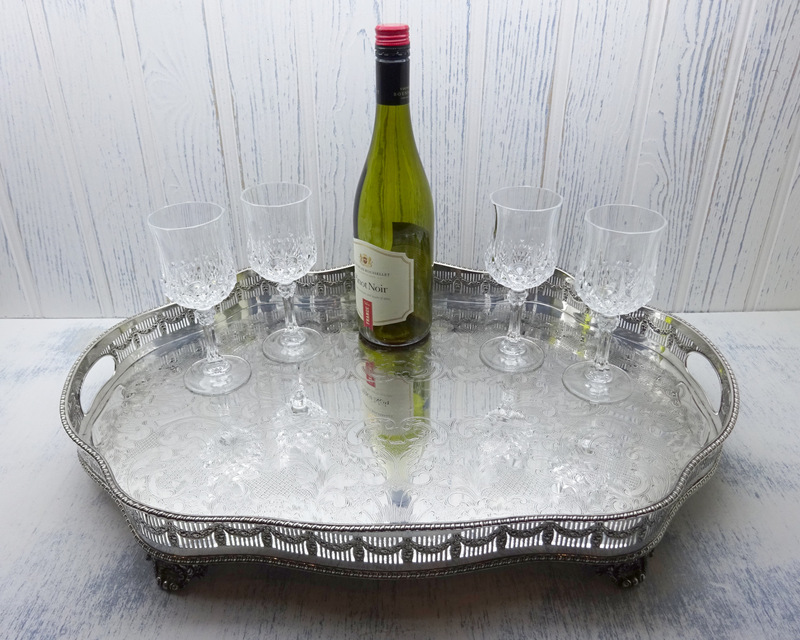 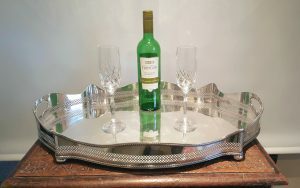 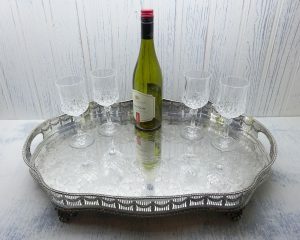 A spectacular silver plated tray of larger than average size – two feet long. 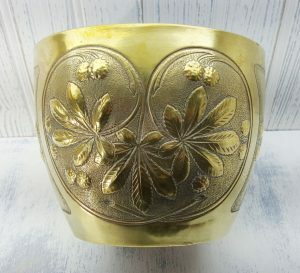 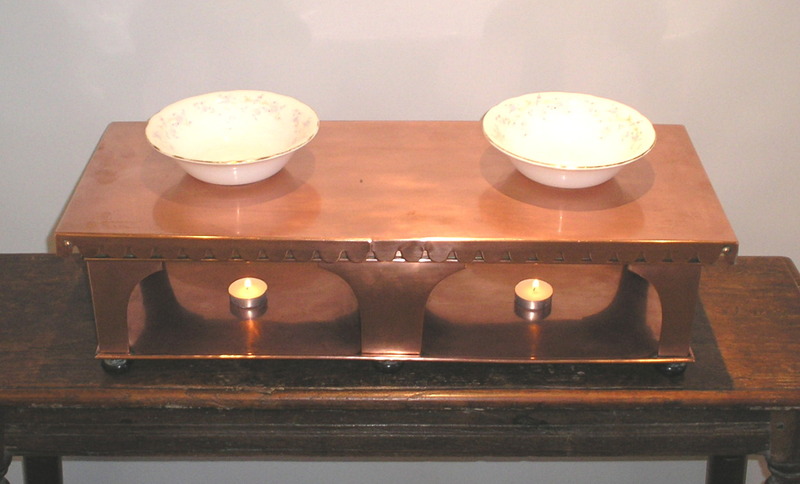 An attractive Art Nouveau brass indoor planter, made by the well known German metalware manufacturer WMF. 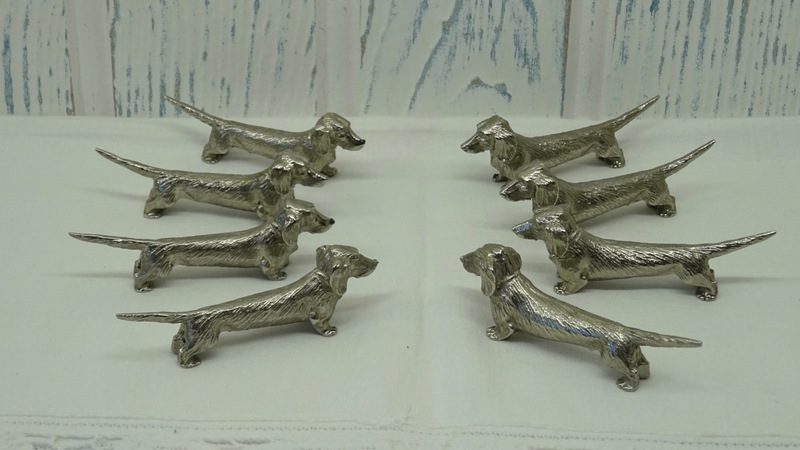 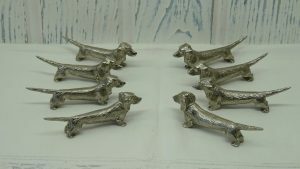 A charming set of eight vintage silver or chrome plated Dachshund (sausage dog) knife rests. 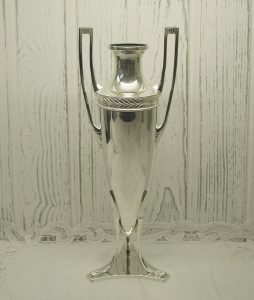 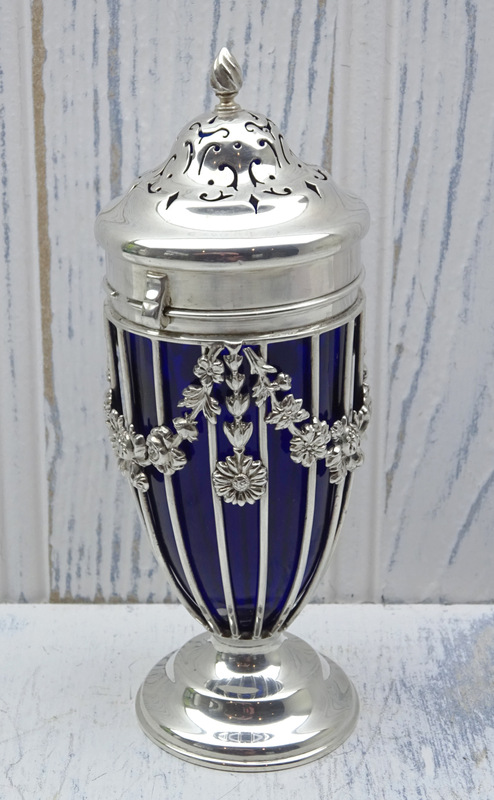 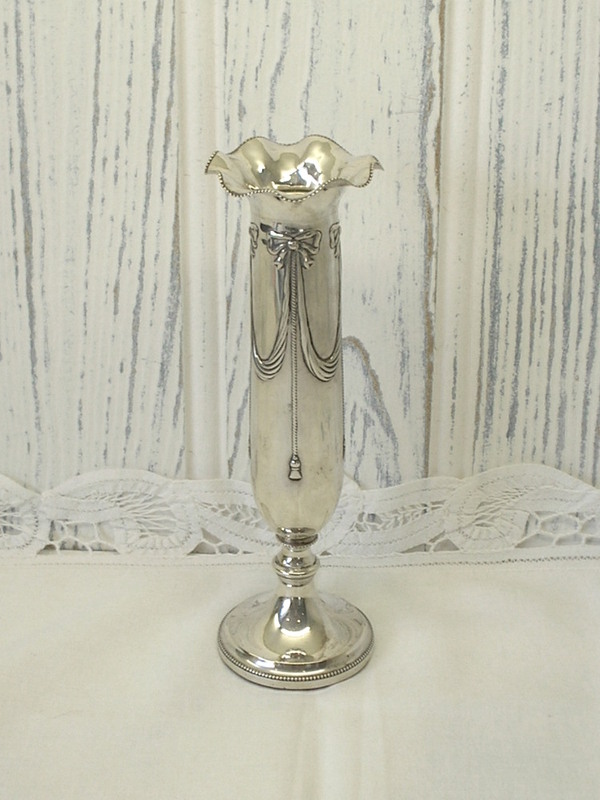 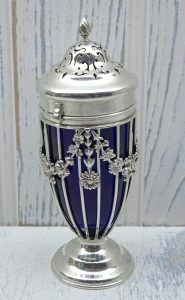 A very pretty Victorian solid silver bud vase made by the Goldsmith & Silversmith Company Ltd. The hallmark is for London, 1898. A superb 19th century brass tazza, featuring an ornate shallow dish with foliate design, over a triple footed elaborate base with attractive stylised dolphins. 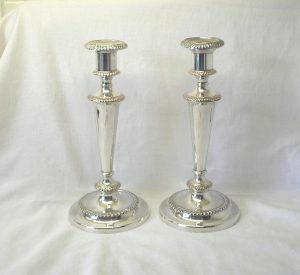 An imposing pair of Georgian silver plated (Old Sheffield Plate) candlesticks in the manner of Matthew Boulton. 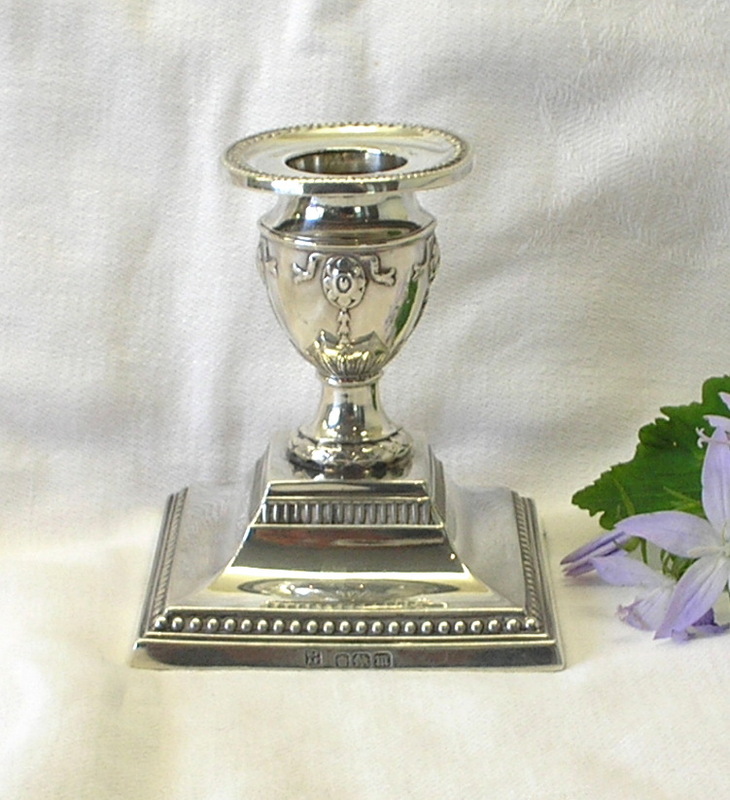 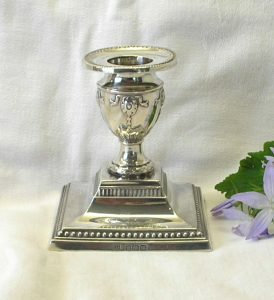 A small late Victorian silver plated classical urn shape lamp by James Dixon & Sons, Sheffield. A rare 2 lb brass bell weight made in the William IV period (1830-37). 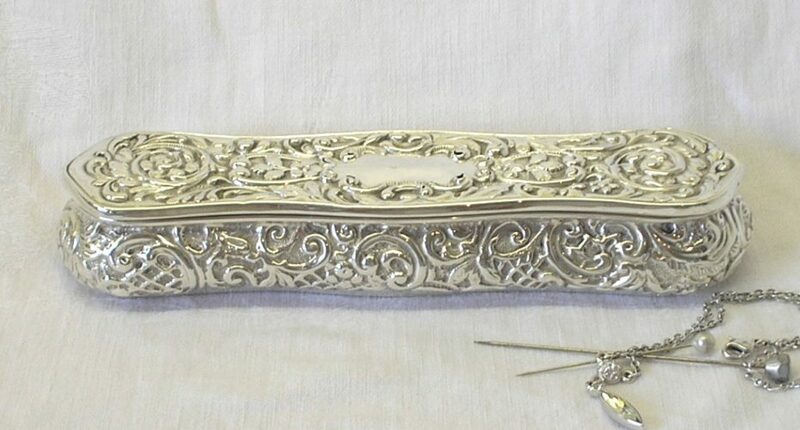 A very pretty solid silver hat pin box, made by the silversmiths Henry Matthews with a Birmingham Hallmark for the year 1901. 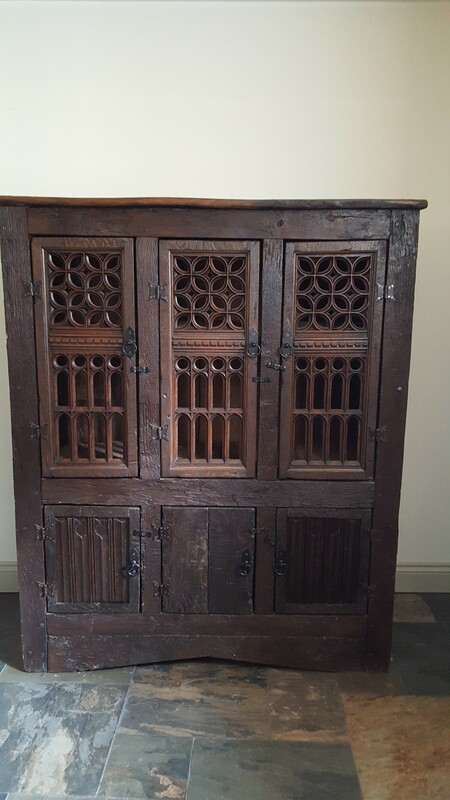 A superb Tudor style carved oak cupboard constructed in the manner of a Gothic aumbry. 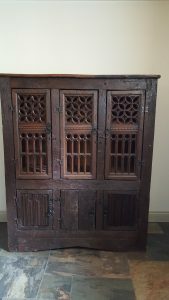 This astonishing cupboard has been made using ancient timbers mostly from the 16th to 19th centuries. 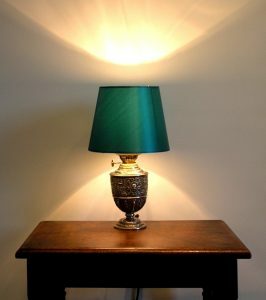 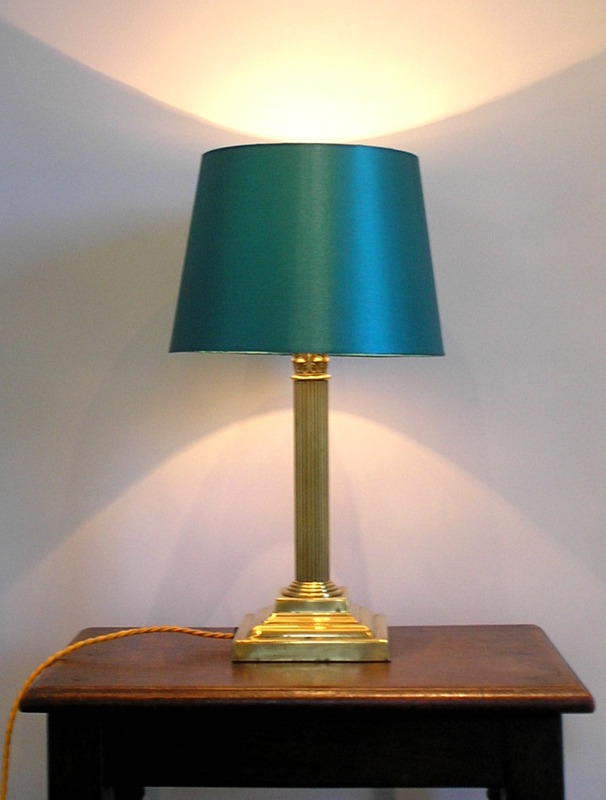 A fine 19th century brass table lamp of large proportions by Faraday & Sons. 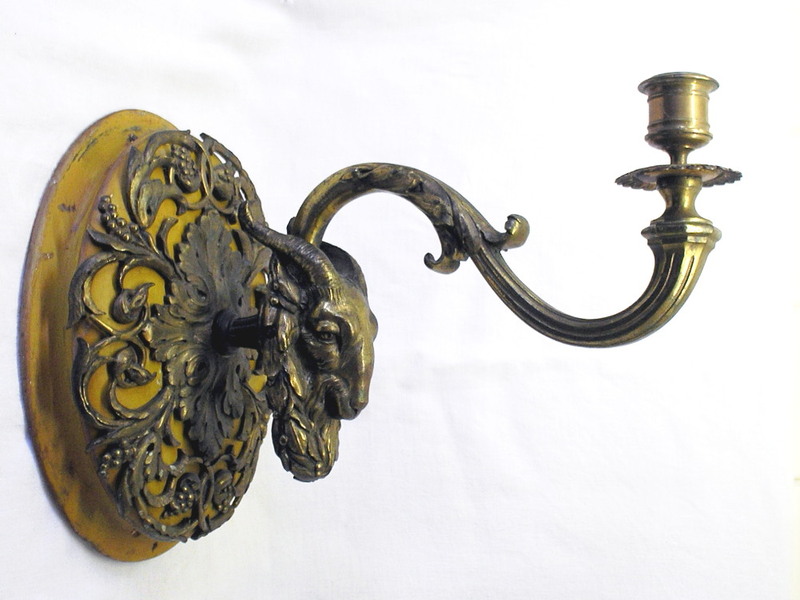 A magnificent and rare Georgian Gothic bronze wall sconce, featuring a goat’s head, mounted upon a shaped oval wooden backplate. 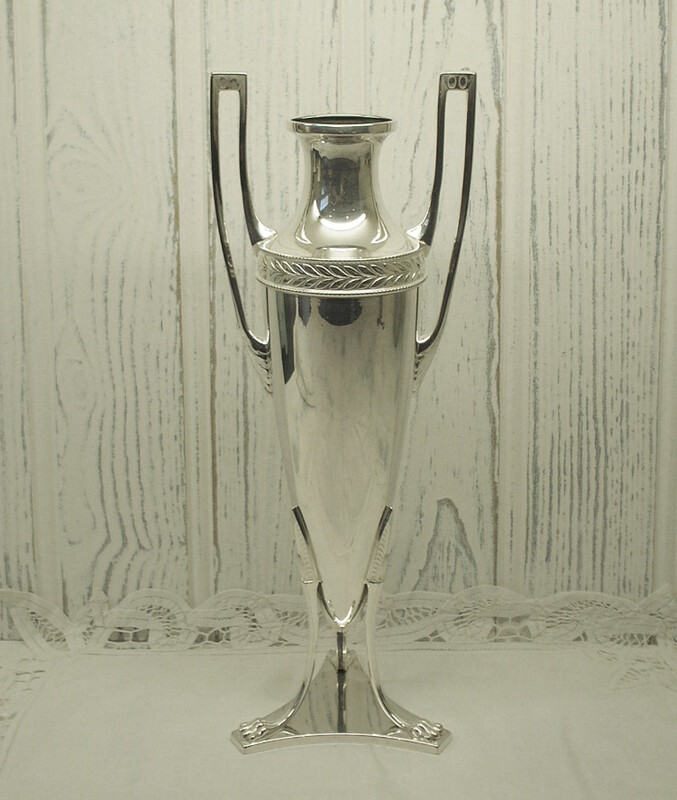 A vintage Dutch silver pen pot or spill vase commemorating the opening of the Dutch branch of the DOW Chemical Company in Terneuzen on 24th May 1965. 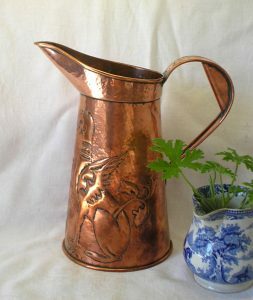 An unusual hammered solid copper ewer with repoussé images of two seated griffins or gryphons guarding an urn. 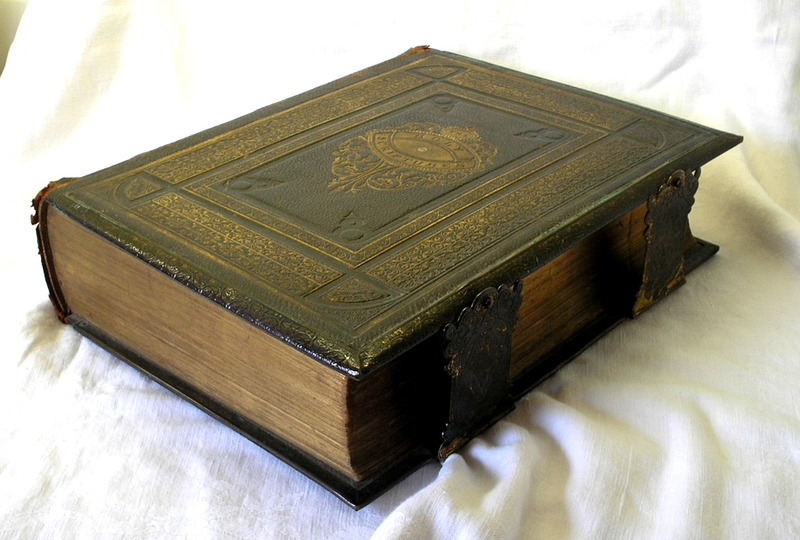 A stunning, heavy, leather bound family bible dating to the mid 19th century. An elegant high quality 19th century silver plated tazza / footed fruit bowl by Sheffield makers Martin Hall & Co, circa 1854-66. 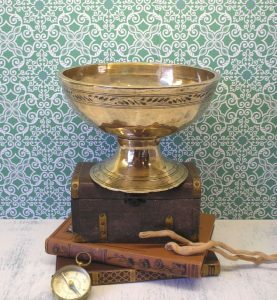 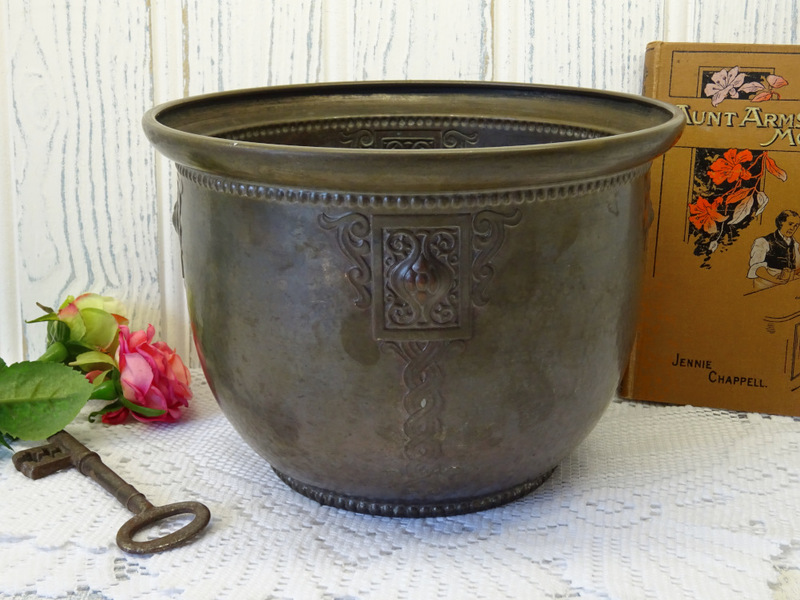 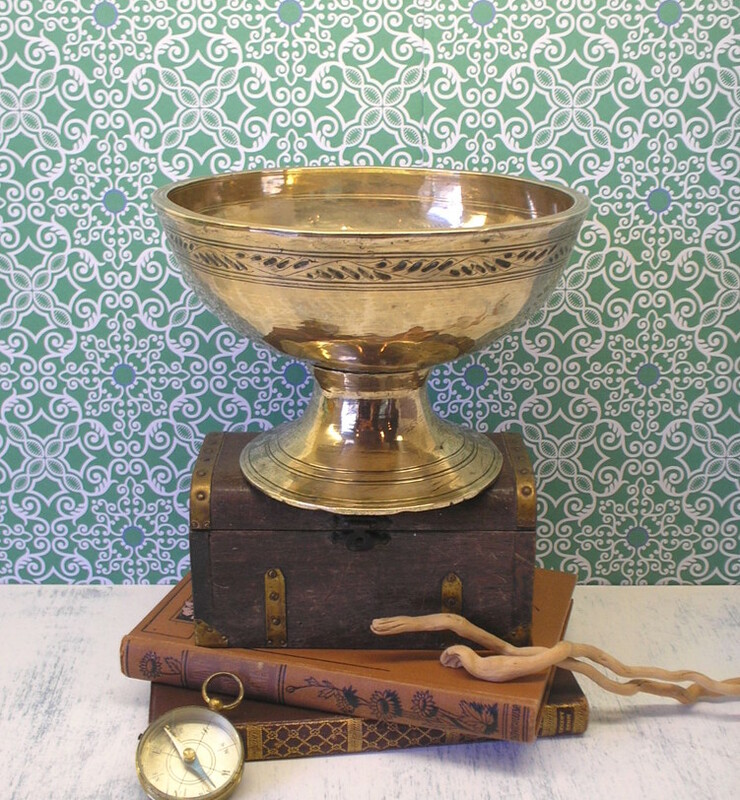 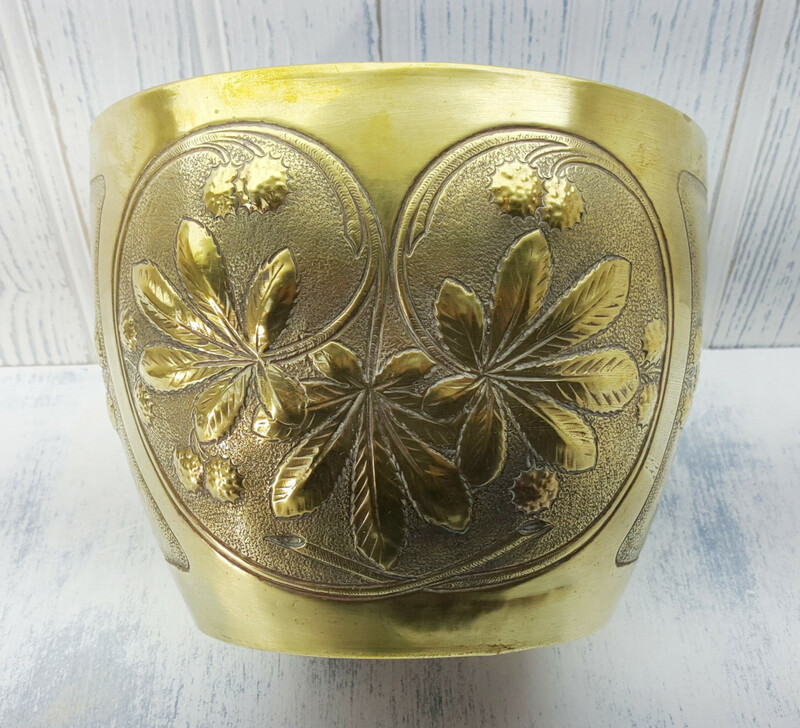 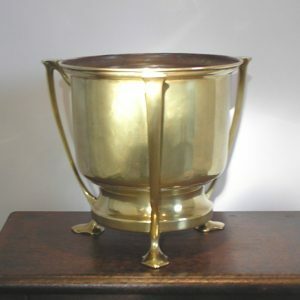 A vintage brass Tibetan pedestal singing bowl with an engraved pattern around the rim. 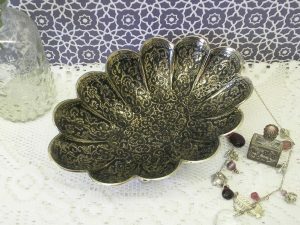 A very pretty Art Deco period, Persian style, bonbon dish. An elegant Art Deco silver plated ink stand with twin lidded inkwells, made by by the famous silversmiths Mappin & Webb. 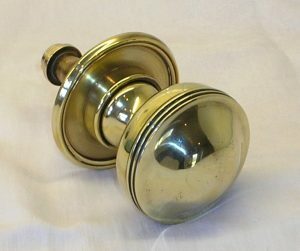 A very chunky and heavy solid brass door centre pull handle. 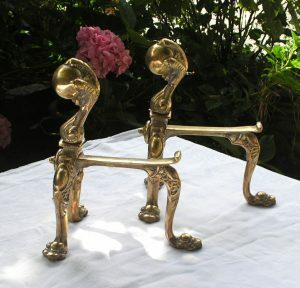 A decorative pair of Georgian style solid cast brass ball and claw design fire dogs / andirons, with claw feet. 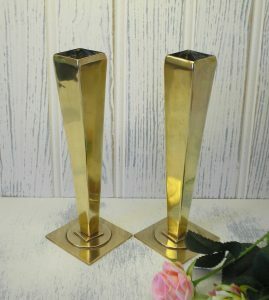 A very stylish pair of Art Deco brass geometric bud vases, with square tapering funnels and asymmetrical bases. A large and beautifully cast brass stallion display piece. 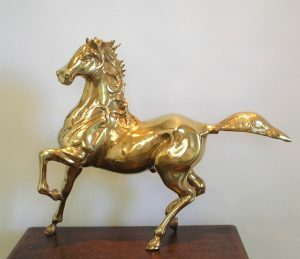 A heavy, well balanced casting, with a gorgeous patina, this imposing horse is stamping and snorting, the typical behaviour of a stallion. 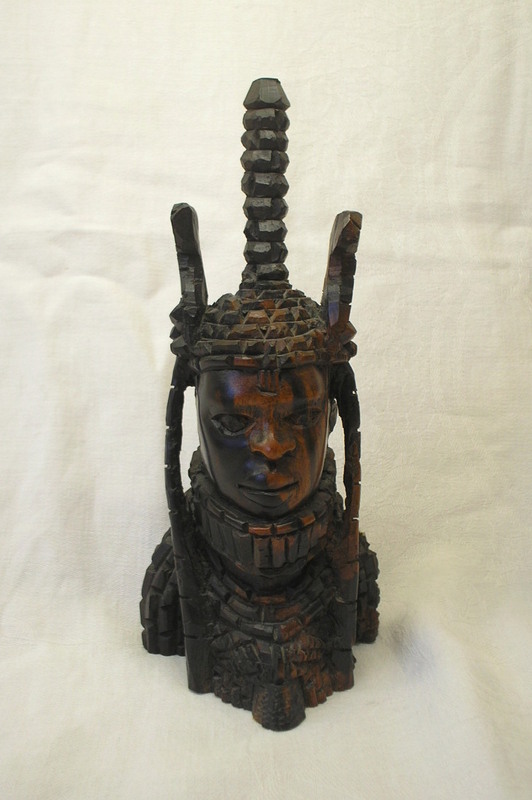 A beautifully carved ironwood bust of the Oba of Benin, probably Eweka I. A lovely example of Africa tribal art. 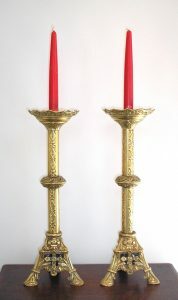 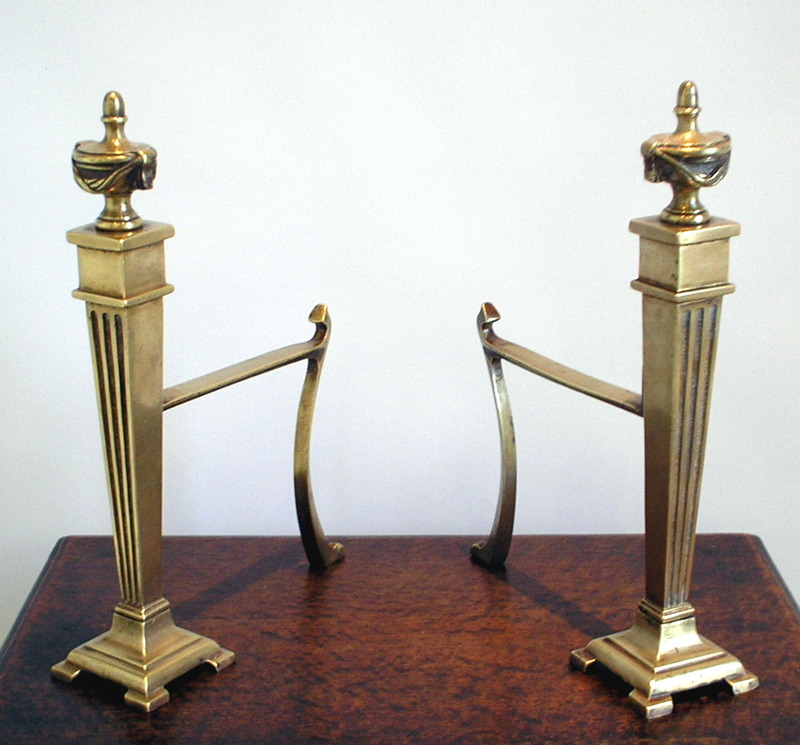 A decorative pair of neoclassical Adam style brass fire dogs / andirons, with polished brass columns and unpolished, blacked, scrolled fronts. 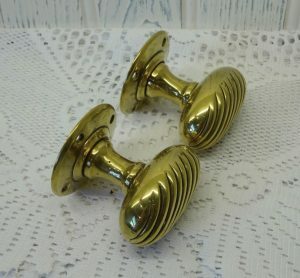 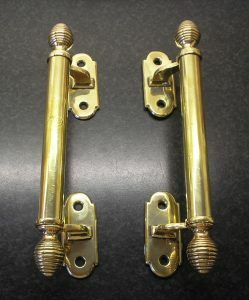 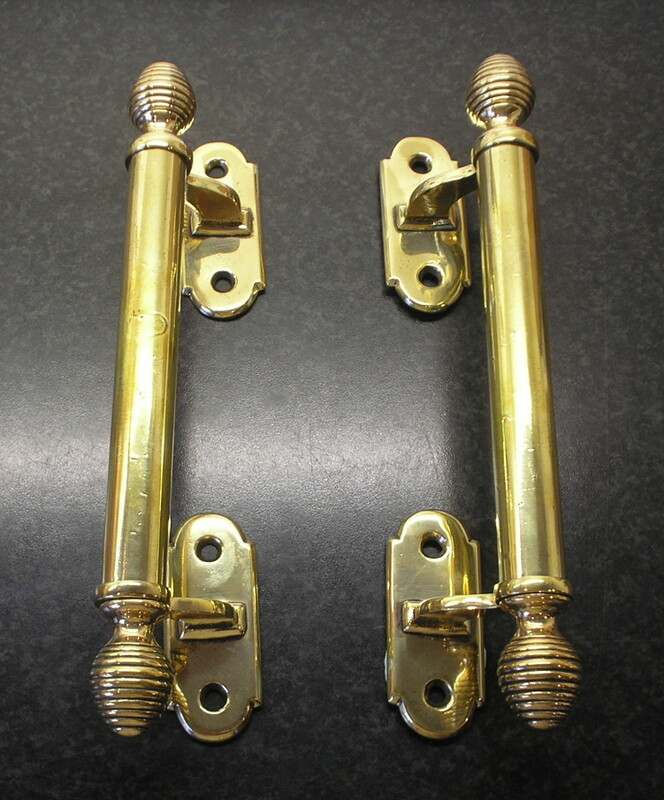 A wonderful pair of Georgian or Regency salvaged brass door handles / pulls, with attractive beehive finials. 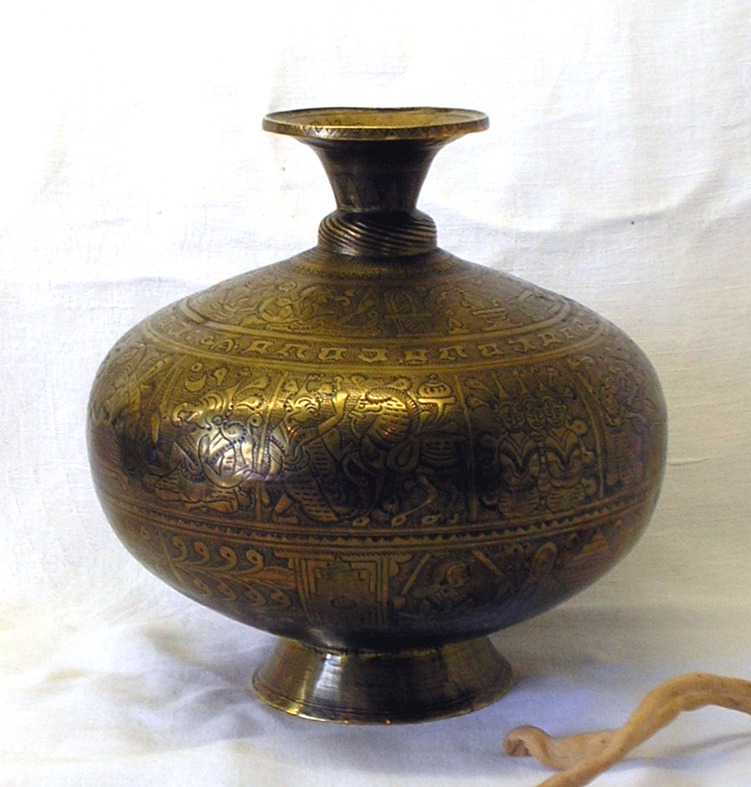 A rare example of a fine 19th century etched brass chambu lota – a vessel for containing holy Ganga water, from Varanasi. 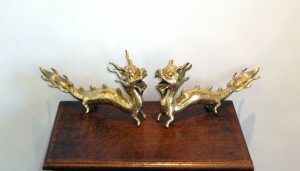 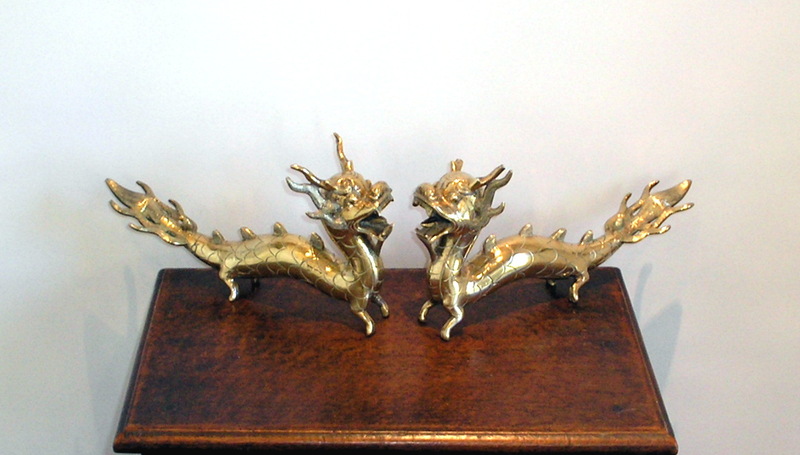 A large pair of vintage Chinese brass dragons, measuring 11 1/2 inches long. 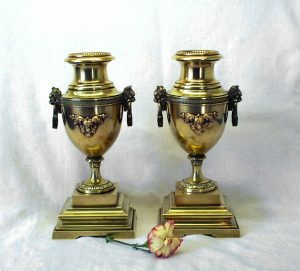 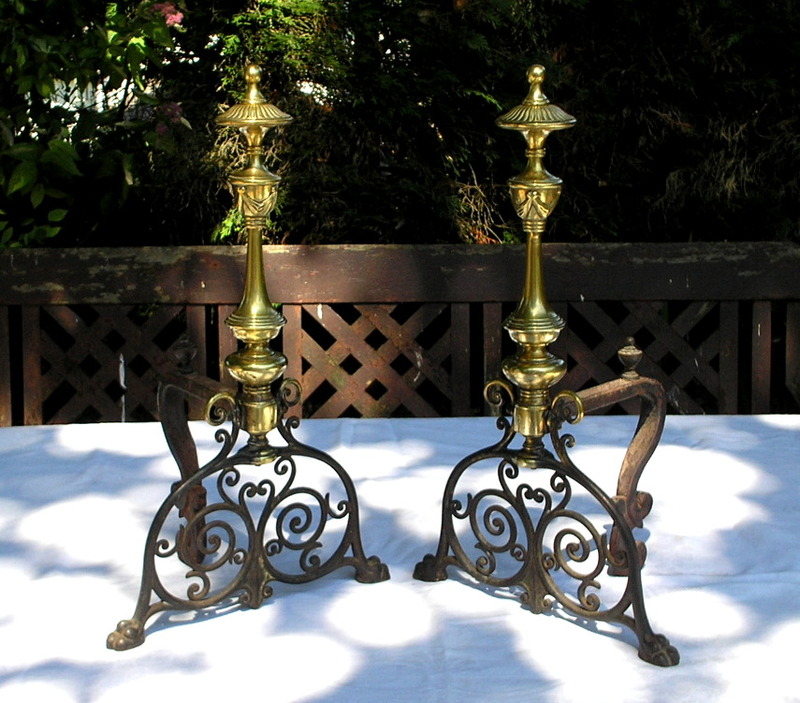 A stunning pair of 19th century neoclassical brass urn-shaped candlesticks or candle holders. 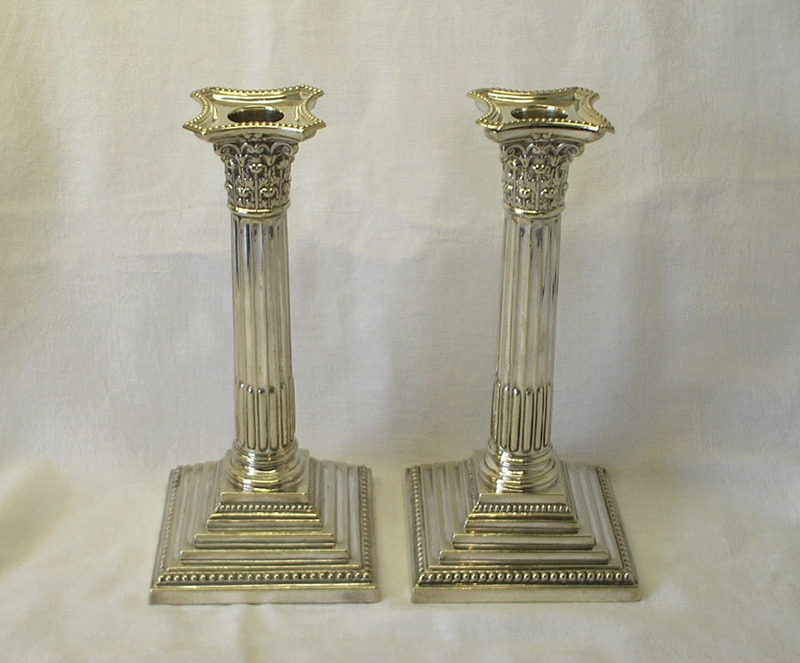 A fine quality pair of Victorian neoclassical dwarf silver candlesticks, by Charles Boyton II of London, dated 1891. 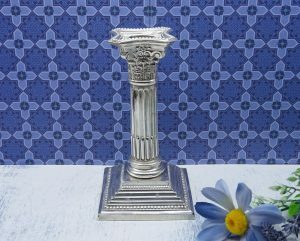 A small and charming neoclassical style gilded and painted antique pier glass or trumeau mirror. 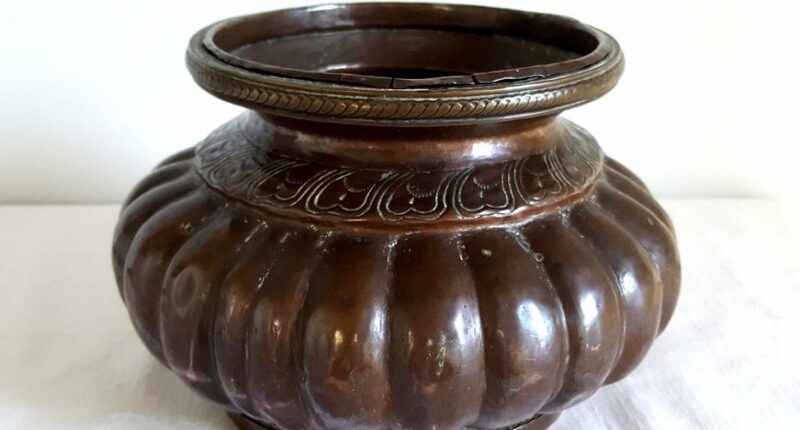 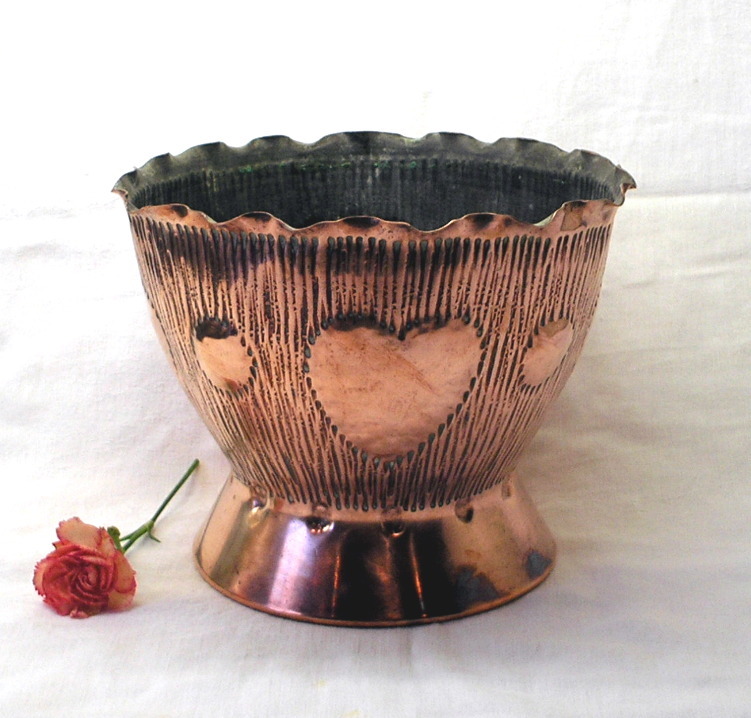 A delightful Arts & Crafts copper jardiniere by the sought after company Benham and Froud. 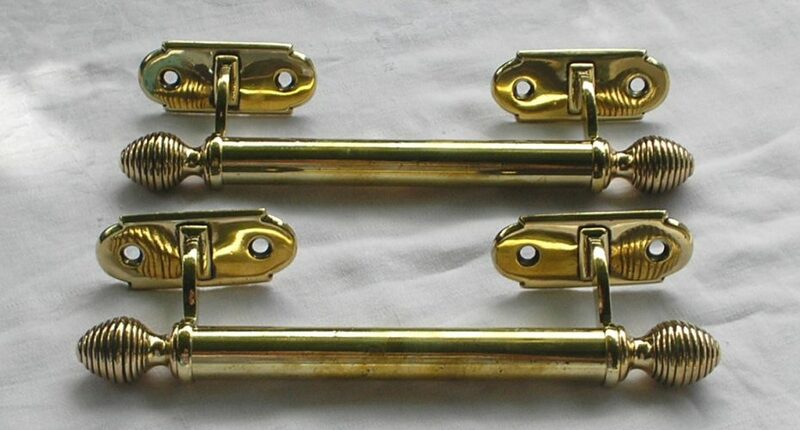 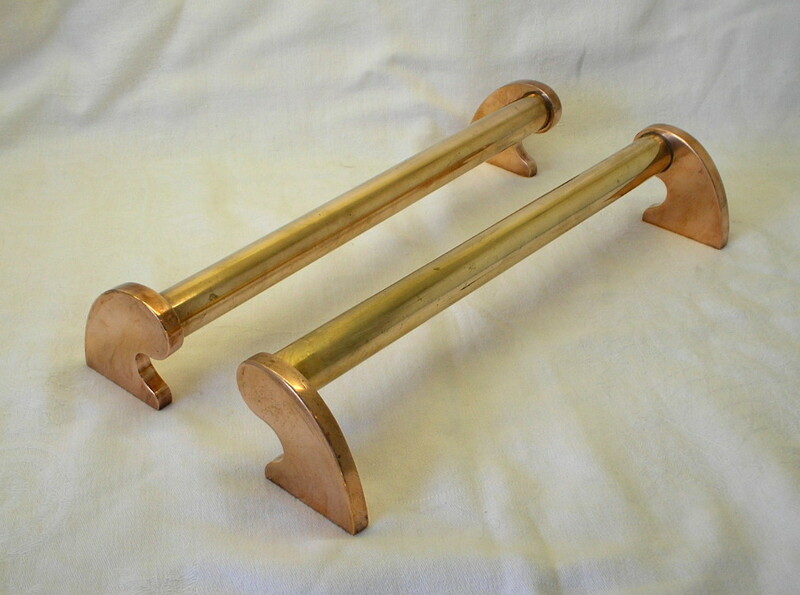 A wonderful pair of Art Deco salvaged brass and copper long door handles / pulls, dating from the 1920’s to 1930’s. 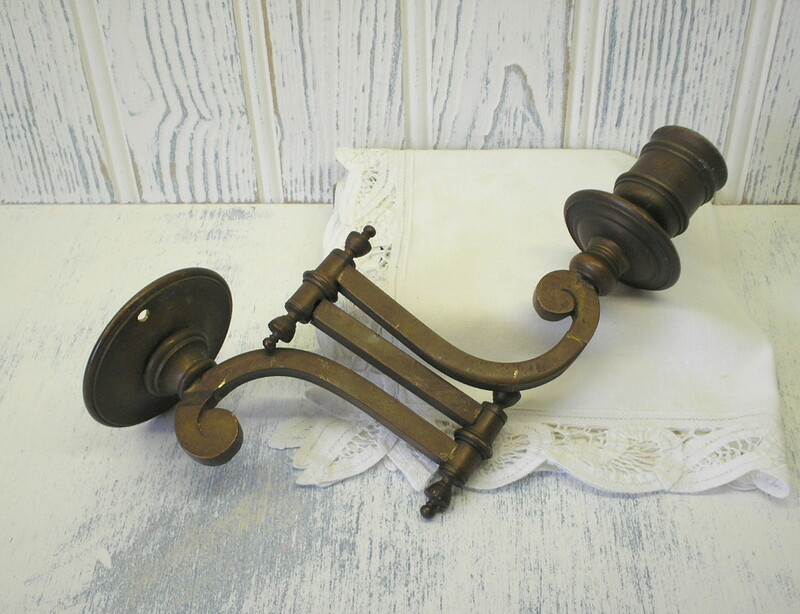 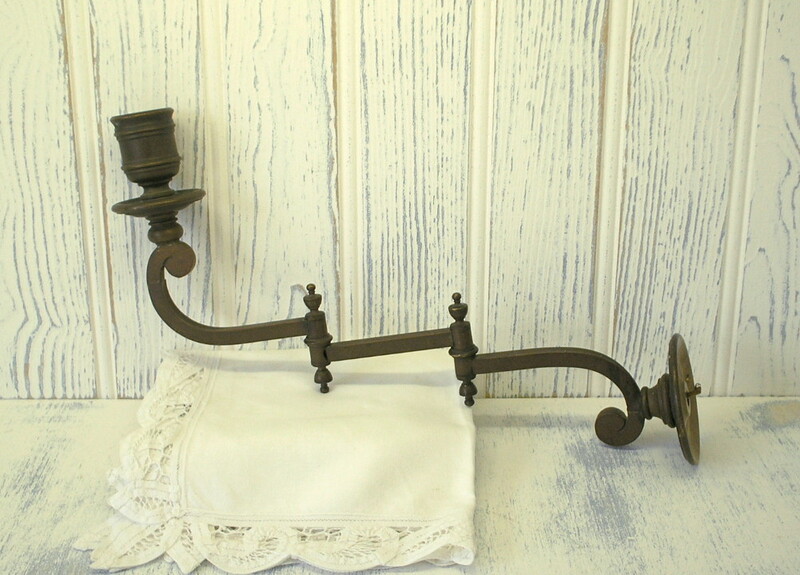 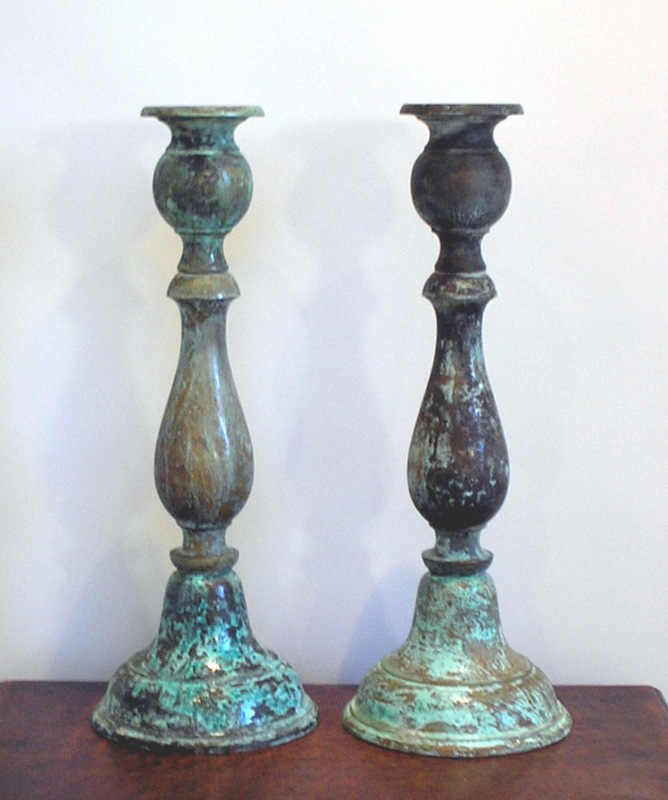 A large pair of vintage brass / bronze 15″ candlesticks in an attractive verdigris finish. An antique brass Corinthian table lamp, in good working condition. 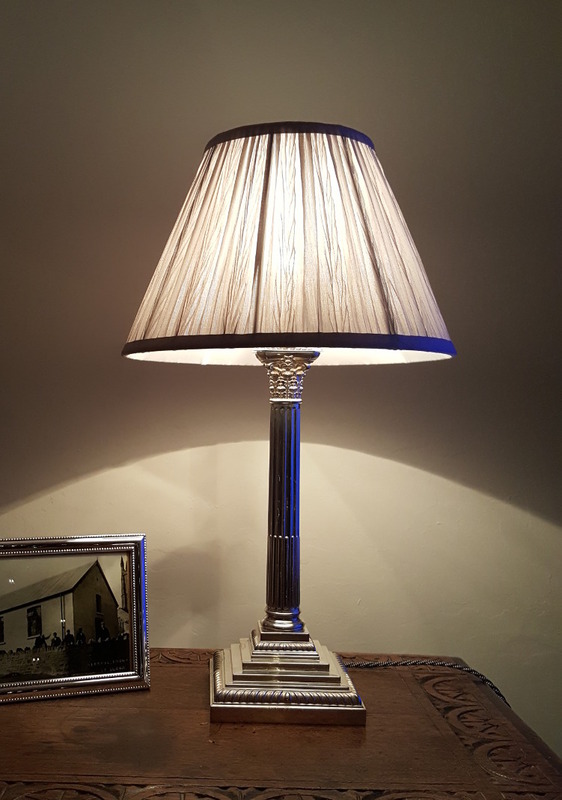 A stunning antique silver lamp by the prestigious silversmith company Mappin & Webb. 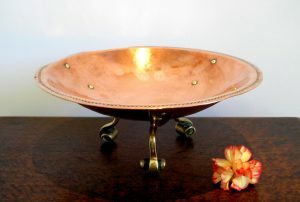 An elegant copper and brass dish or footed bowl in the Arts and Crafts style. A good pair of neoclassical Adam style brass fire dogs / andirons. 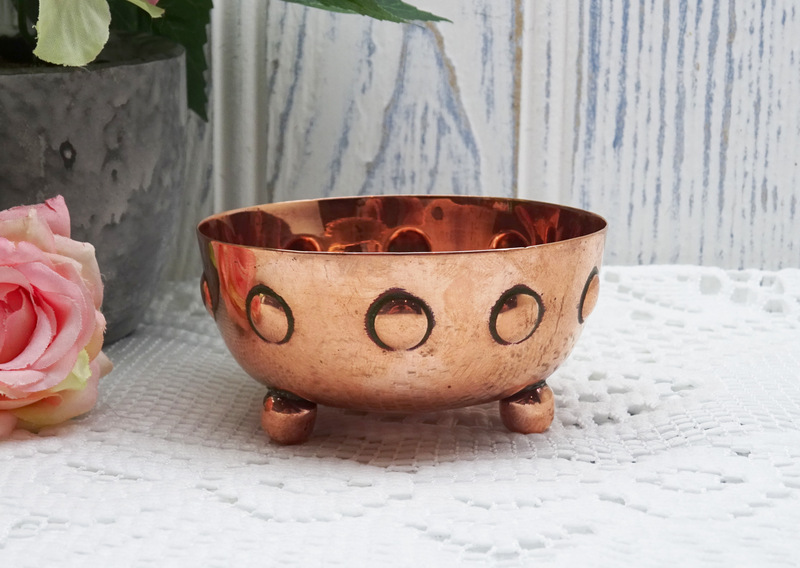 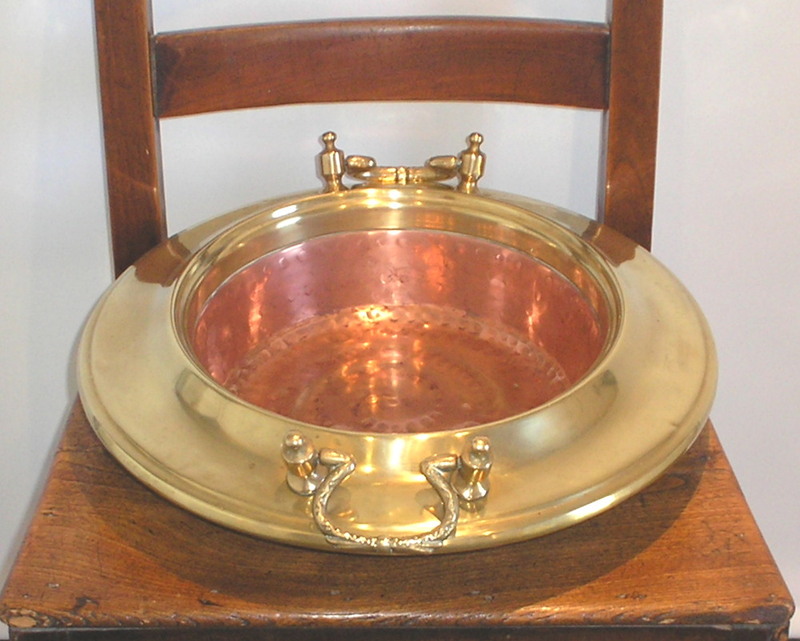 A fine copper tray of oval form raised on four round feet. 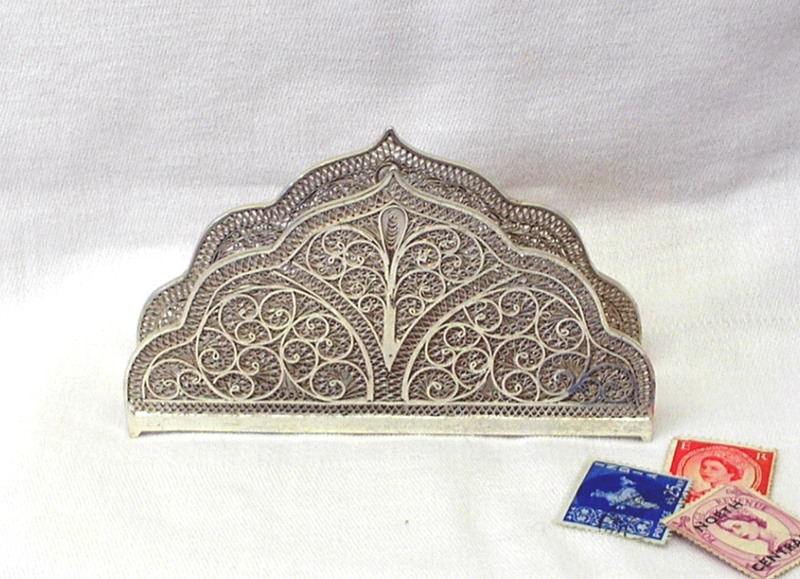 An exquisitely crafted letter rack with beautiful filigree silver detail. 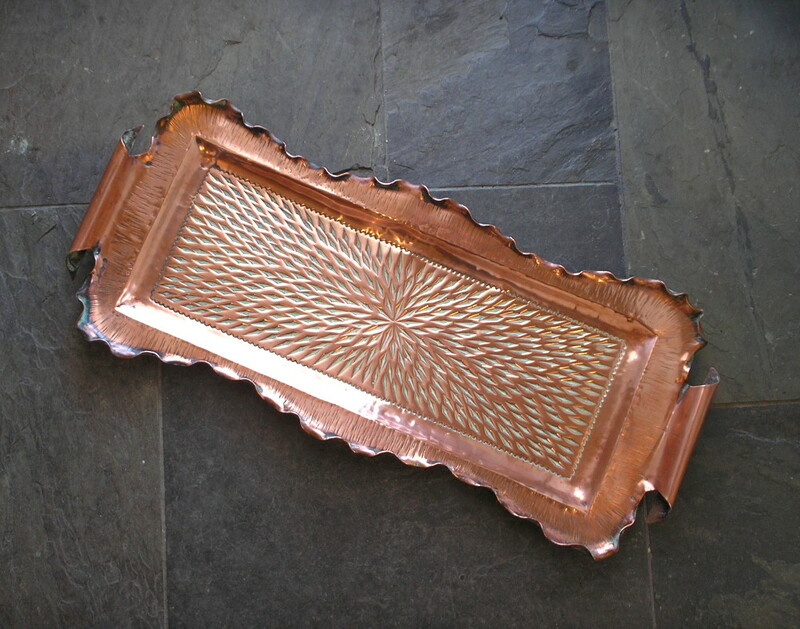 An attractive rectangular Arts and Crafts copper tray. A fine antique Middle Eastern / Indian copper and brass vessel. 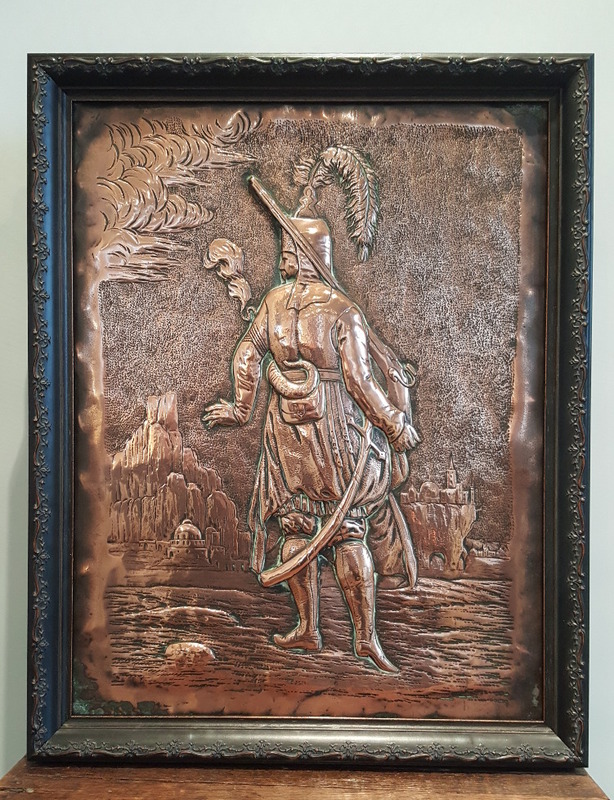 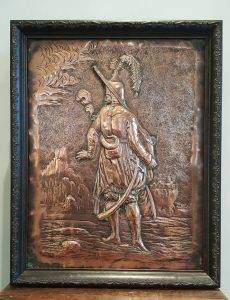 An interesting framed copper wall-hanging plaque depicting a scene possibly of an Ottoman Empire subject. 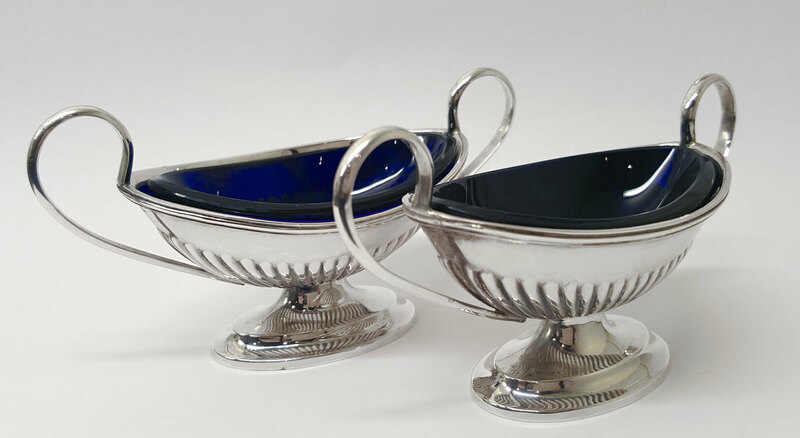 An elegant pair of Victorian / Edwardian Sterling silver boat-shaped salt cellars with cobalt blue glass liners, by Hilliard & Thomason, dated 1901. 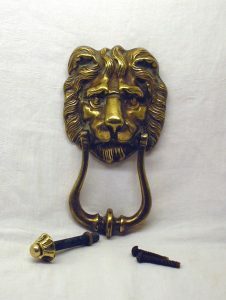 A large and heavy solid brass door knocker in the shape of a lion’s head. 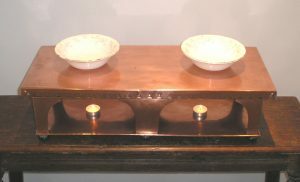 An unusual brass and copper inset bowl with two cast brass swan-neck handles. 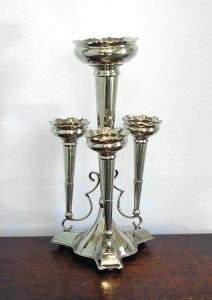 A stunning Edwardian dwarf candlestick by William Charles Fordham & Albert Faulkner. 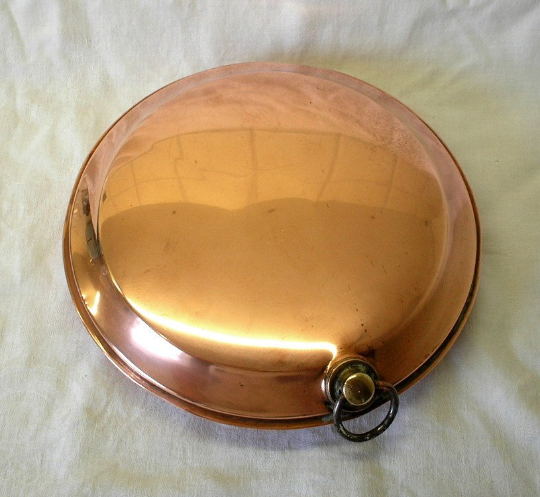 A large late Victorian copper food warming plate. 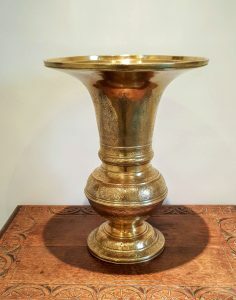 An exceptionally elegant antique Arts and Crafts brass jardiniere / planter by the renowned William Soutter of Birmingham. 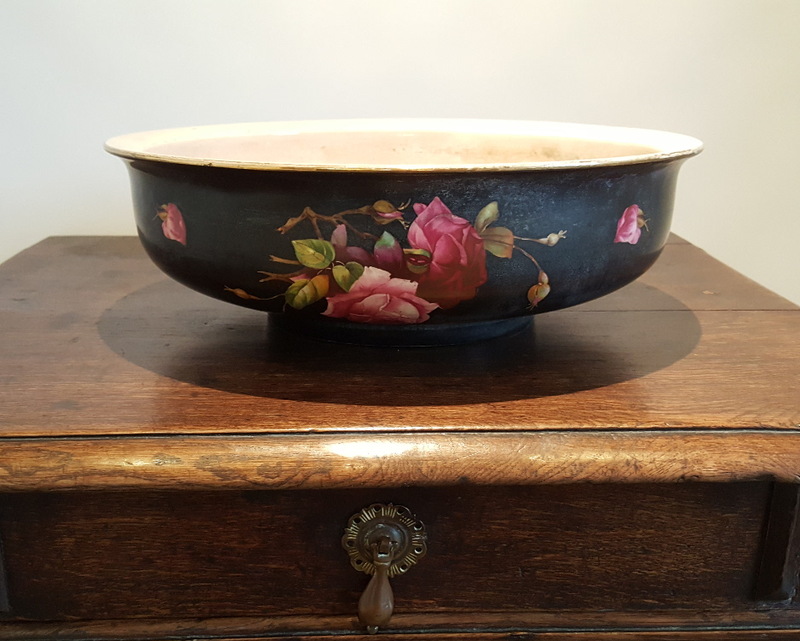 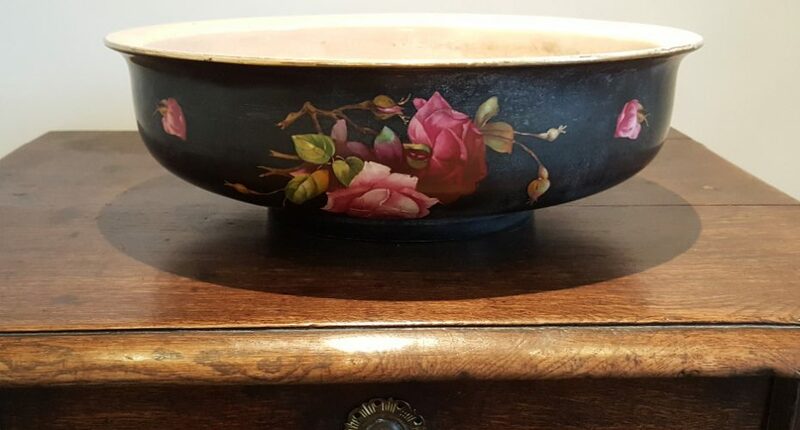 An attractive and large Victorian pottery bowl, suitable for a variety of uses. 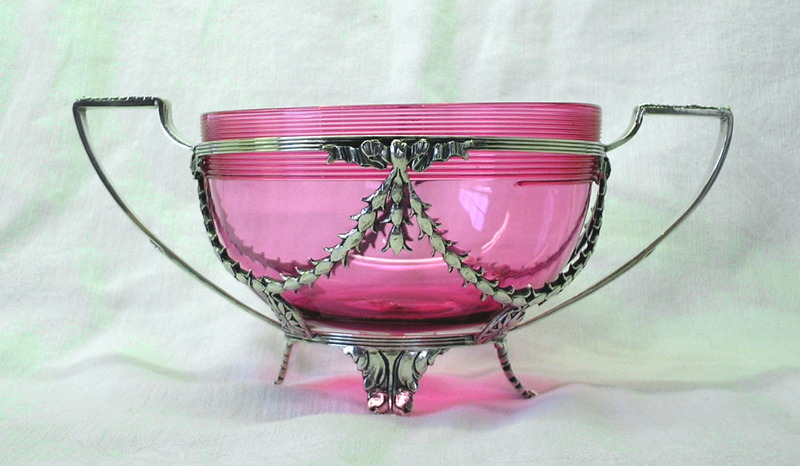 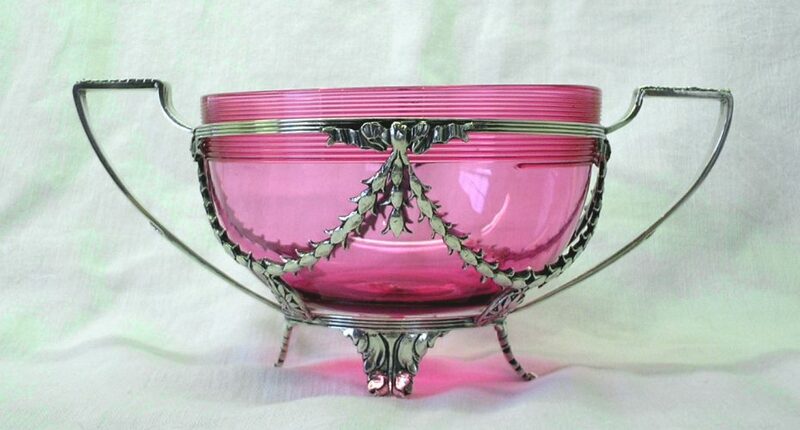 A beautiful and elegant bonbon dish comprising of a pretty cranberry pink glass liner (which is ribbed around the top) and a lovely twin handled silver stand.